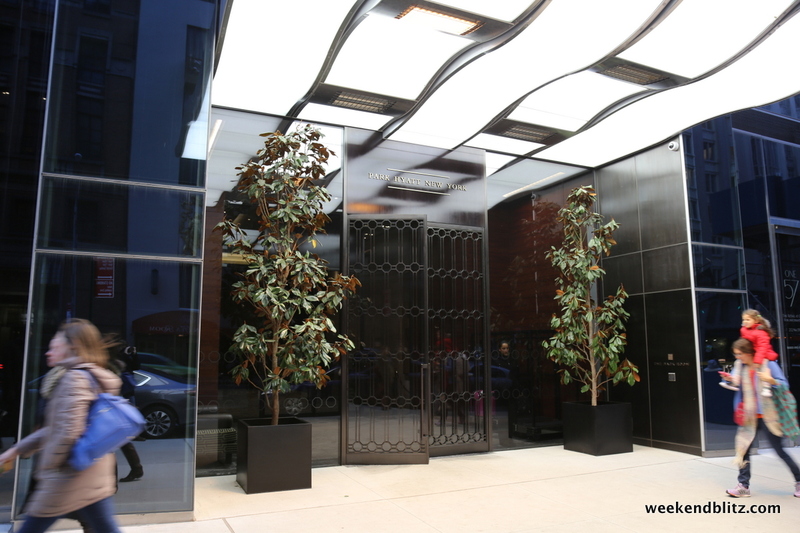 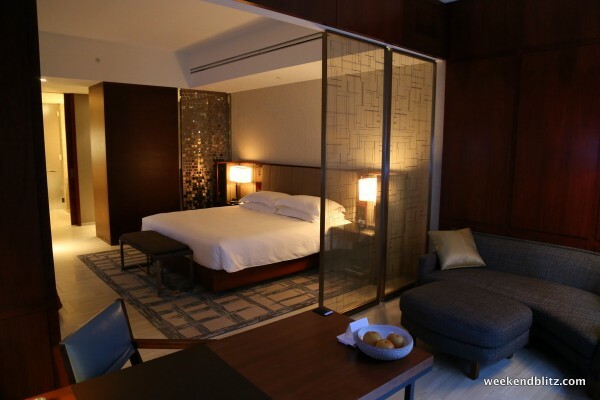 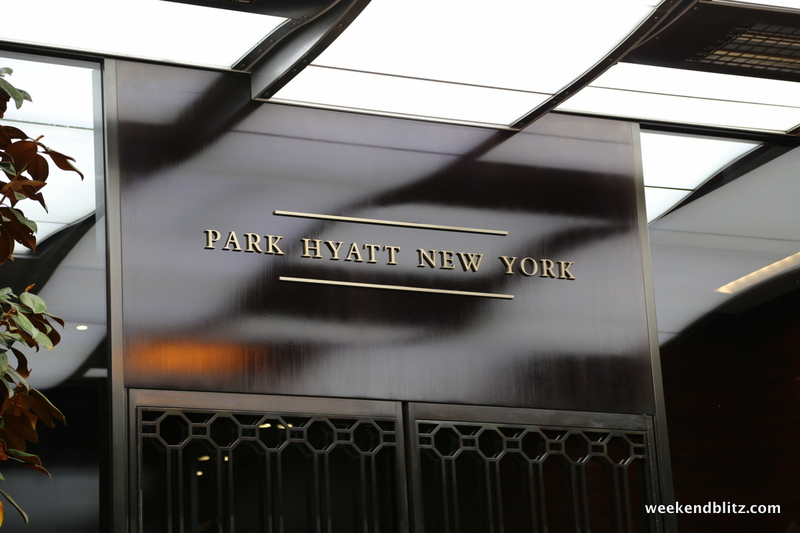 Although Jeffrey always handles hotel bookings, I had absolutely no hope of staying at the new Park Hyatt New York — Jeffrey had told me that he had checked and you couldn’t book it with points just yet. 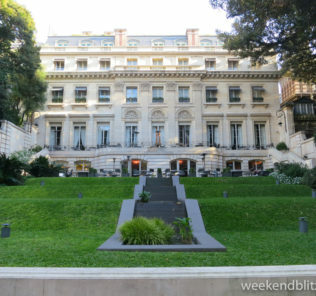 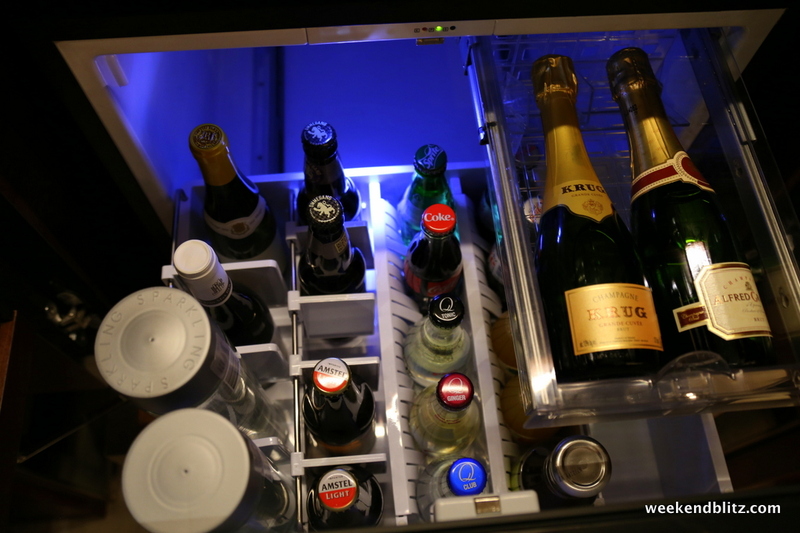 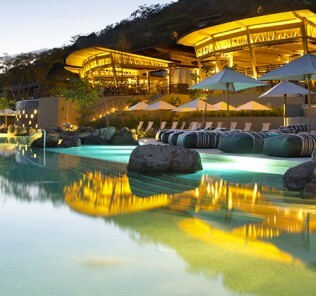 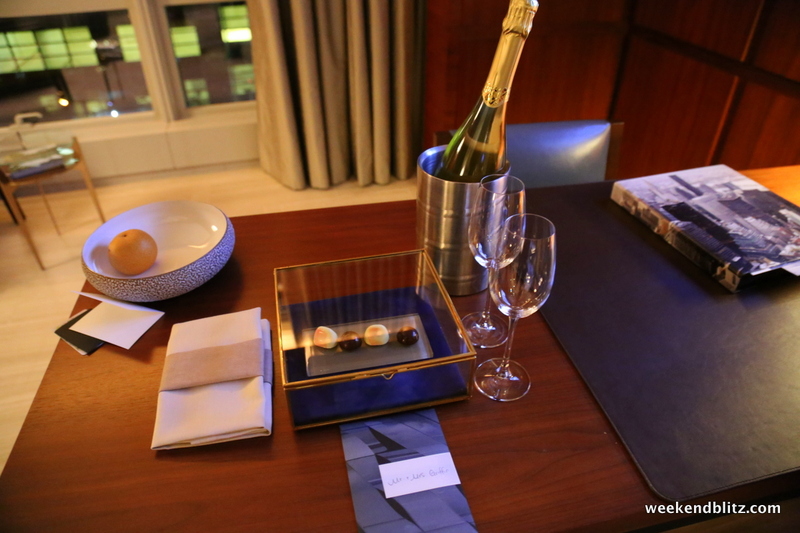 He had called Hyatt Gold Passport and asked about booking with a Points + Cash rate and then applying a Diamond Suite upgrade to the reservation. 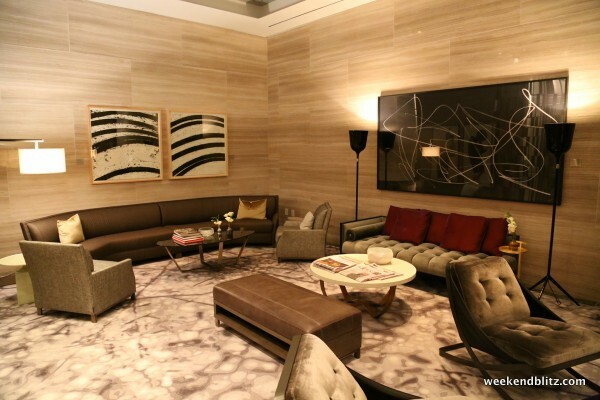 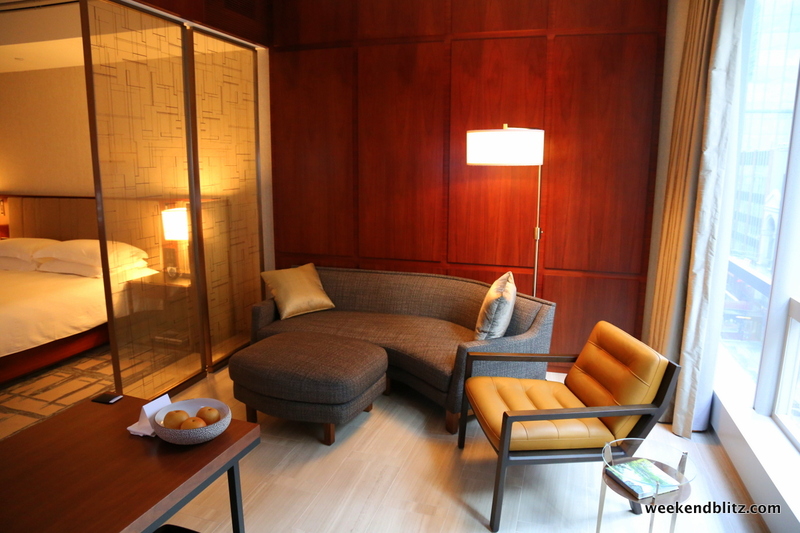 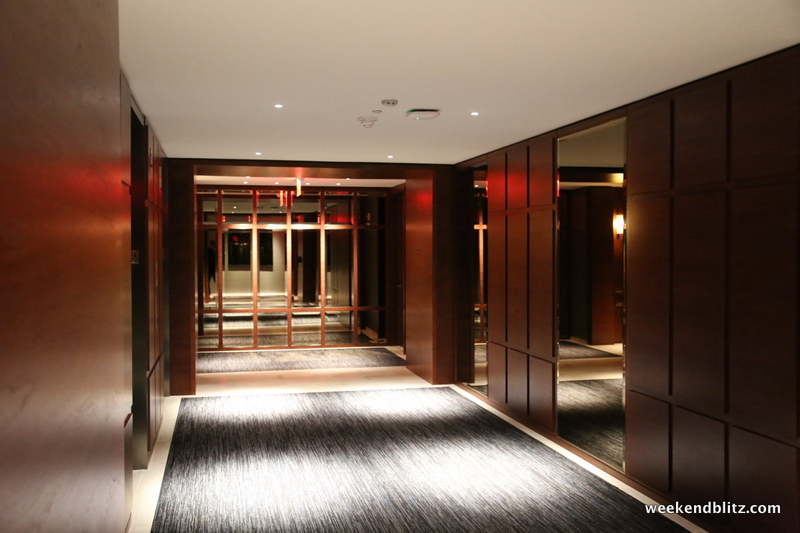 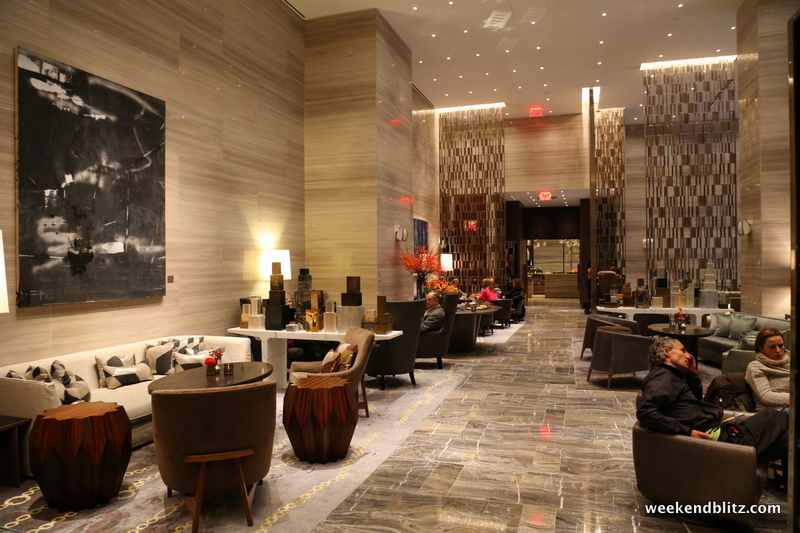 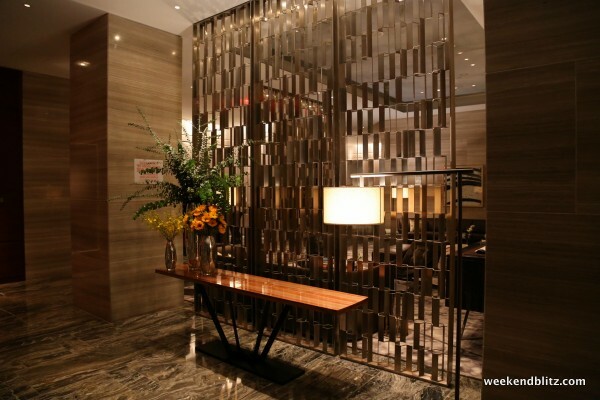 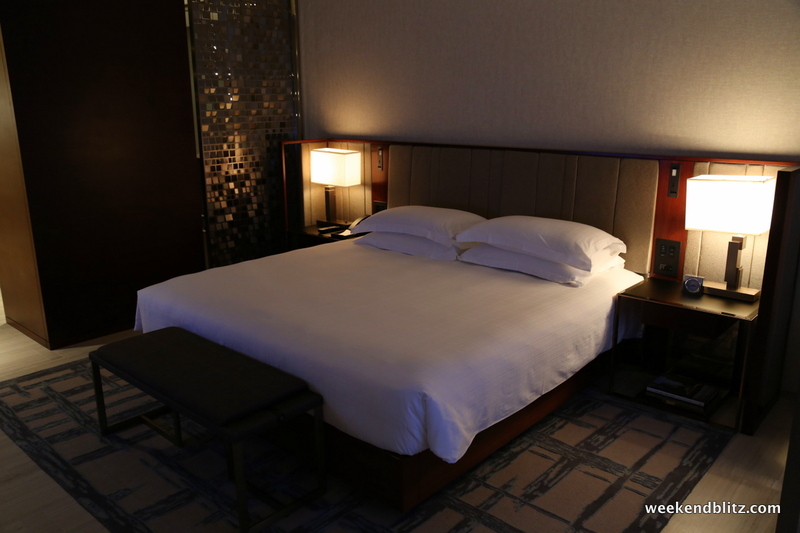 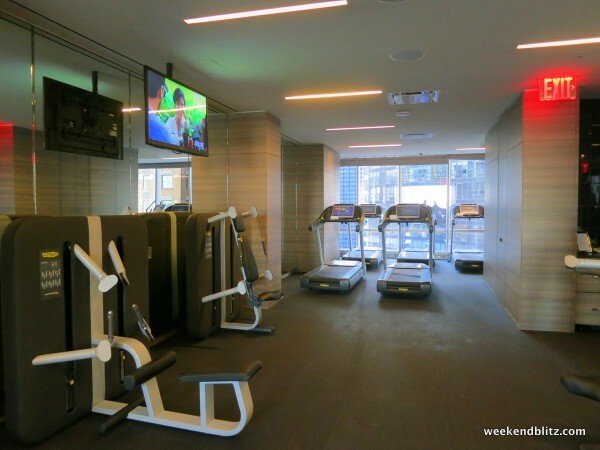 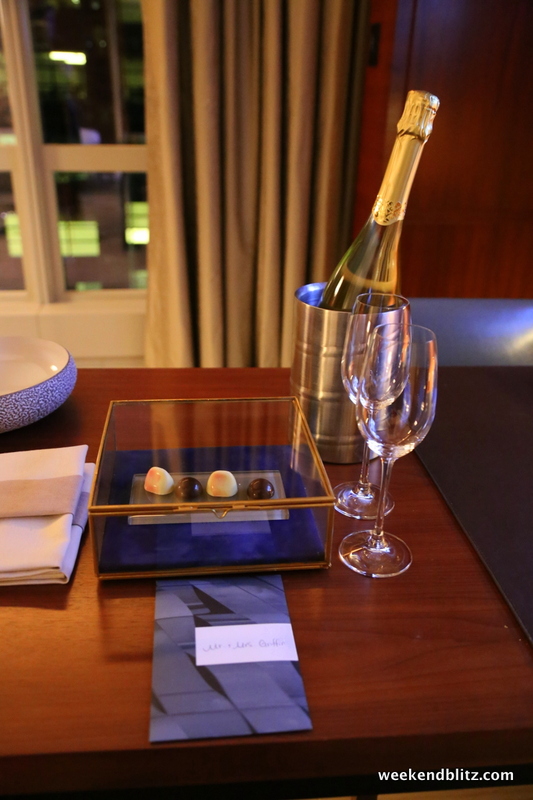 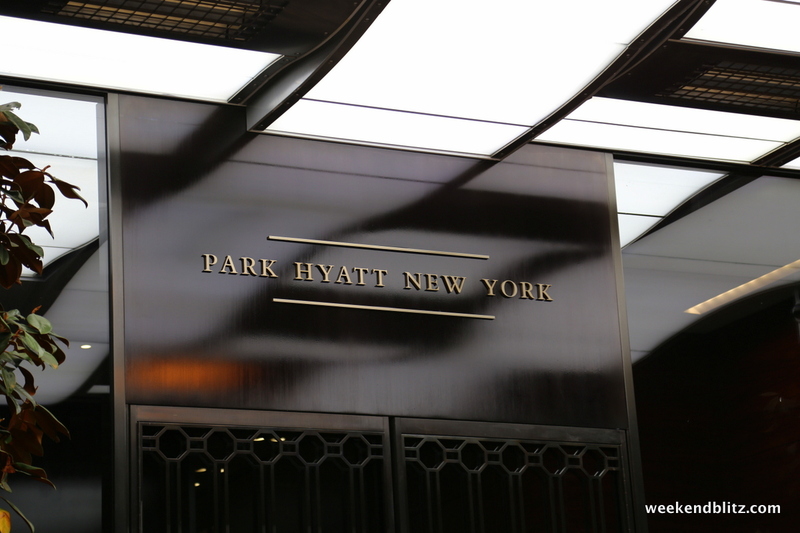 The phone rep said that since the Hyatt New York is a “special property, they do not participate in the suite upgrade program.” She only offered him a suite upgrade rate of 30,000 Hyatt Gold Passport points + $400 per night — no thanks. 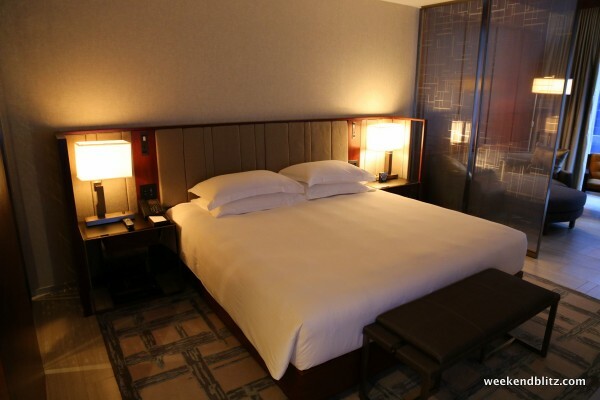 But, when he went online a few days later (and right before our trip), they were offering base rooms (Park Deluxe King) for 30,000 points so he booked it! 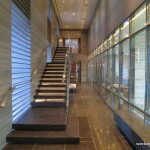 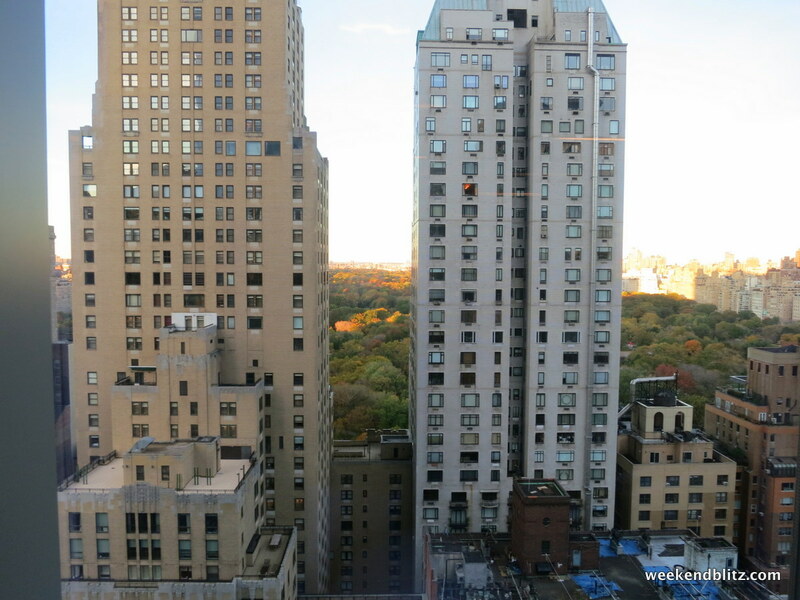 The property is smack-dab in the middle of Midtown and very convenient to subway lines. 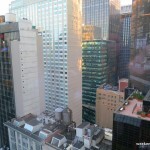 We were dropped off at the corner of 57th and 7th and had just a 1/2 block stroll over to the hotel. 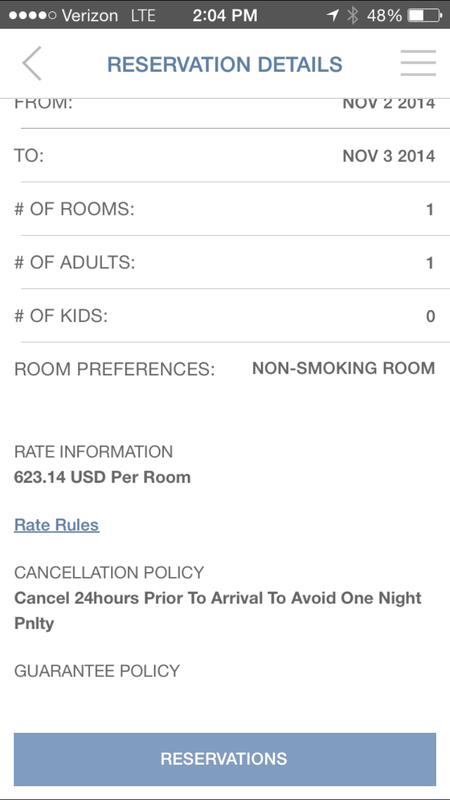 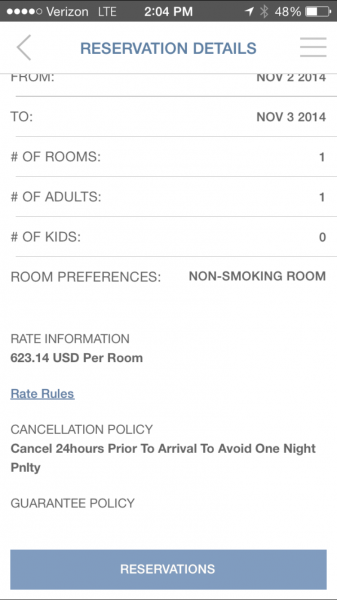 Right before we got to the hotel, Jeffrey logged into his Hyatt app to confirm the reservation and noted that instead of being listed as 30,000 Hyatt points, the rate was listed at $623.14–this might shed some light on how Hyatt corporate and individual properties transfer points and money. 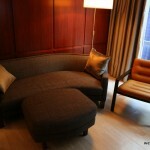 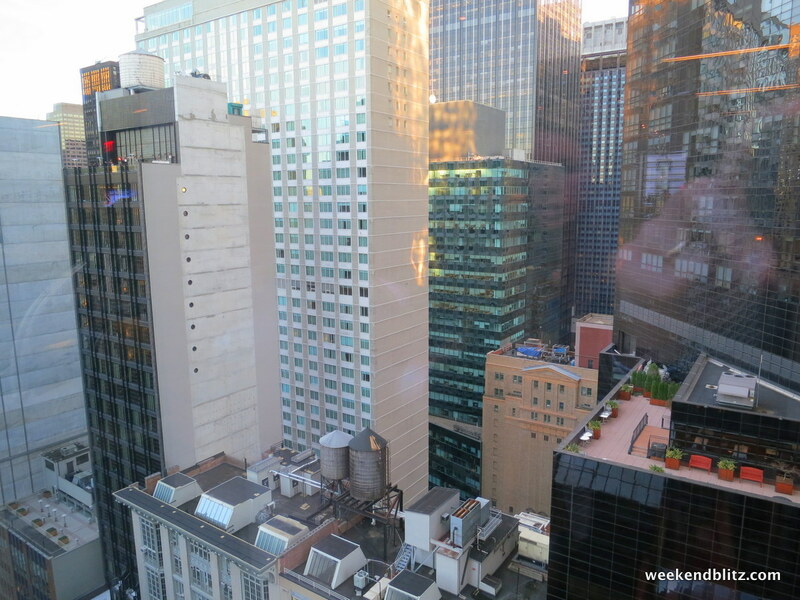 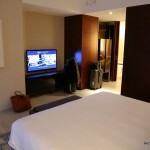 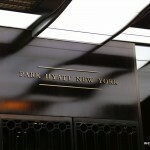 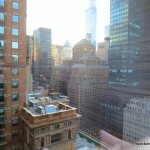 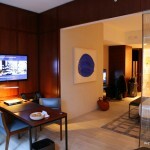 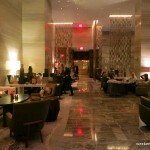 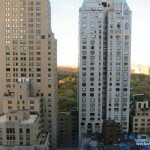 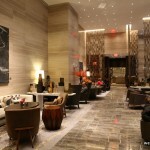 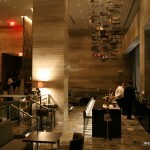 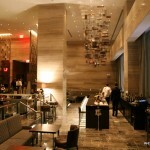 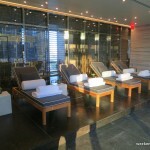 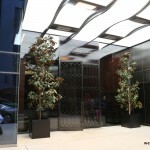 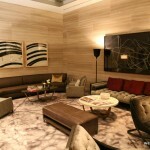 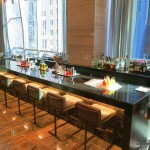 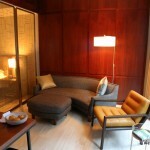 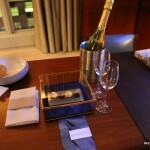 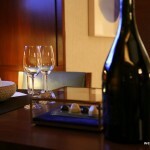 Presumably, the Park Hyatt New York received $623 from Hyatt Gold Passport for our stay? 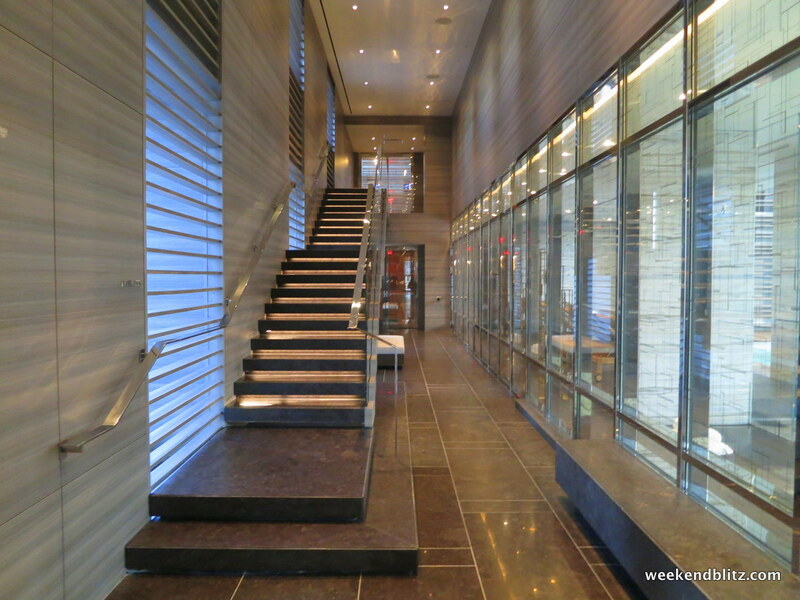 Multiple bellmen were waiting on the sidewalk of the 90-story One57 tower to greet us, although none insisted upon carrying our baggage. 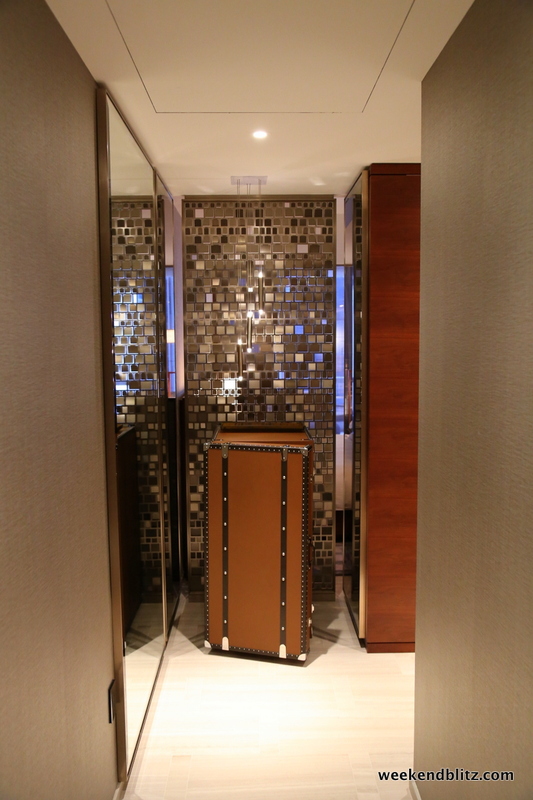 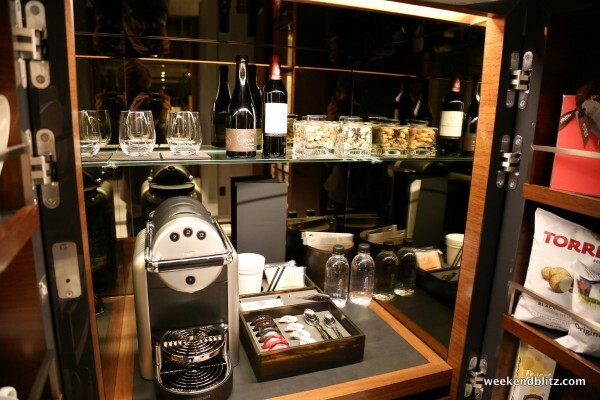 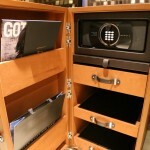 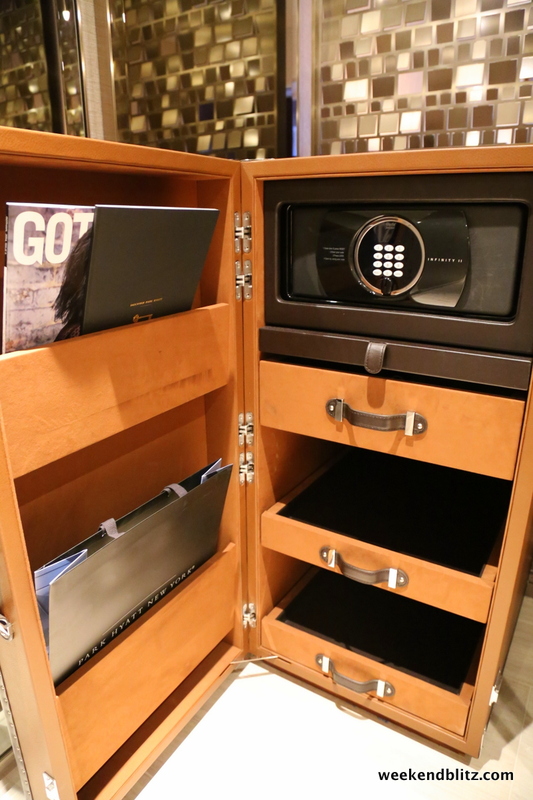 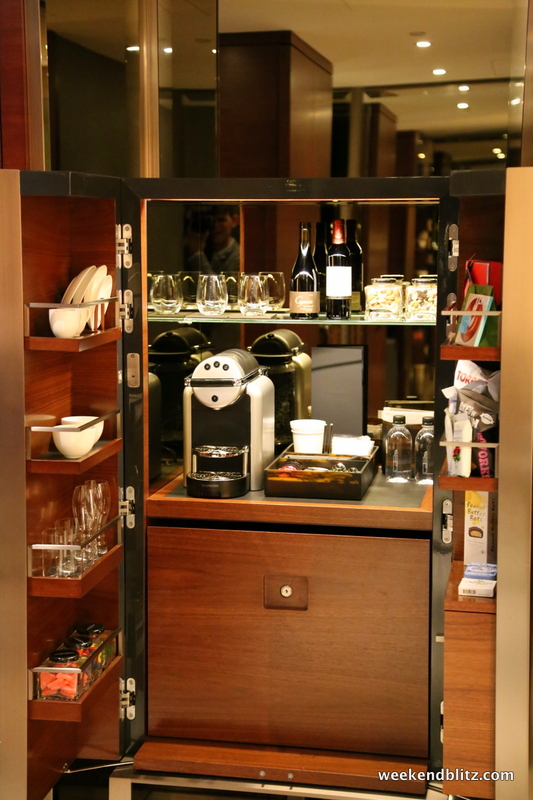 Although we considered this to be a perk because we feel much more comfortable managing our own luggage, some Park Hyatt guests may think otherwise. The 90-story tower is humungous, but only the first 25 floors are part of the Park Hyatt. 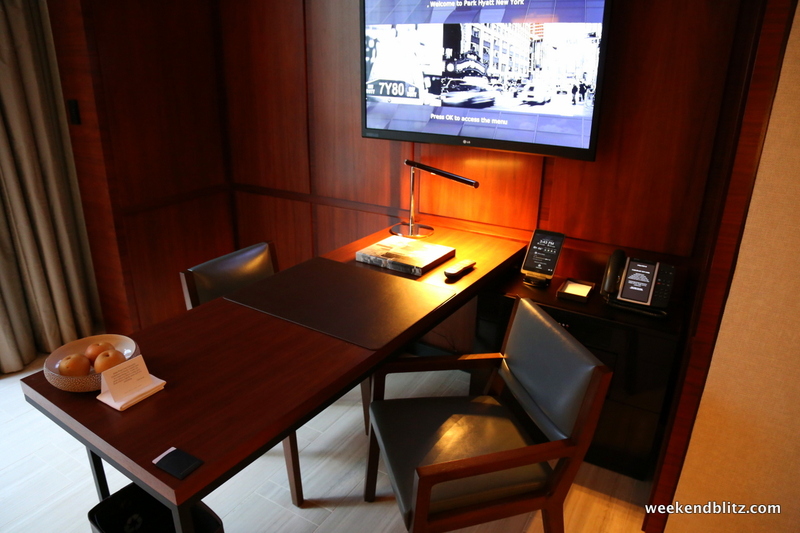 After walking through two sets of double doors (that swing with a touch of one of the bellman’s remote controls), we walked in to find a mini reservation/check-in desk. When we arrived, though, they were having trouble with their iPads and escorted us onto an elevator to the main lobby and main reception area for our check-in. 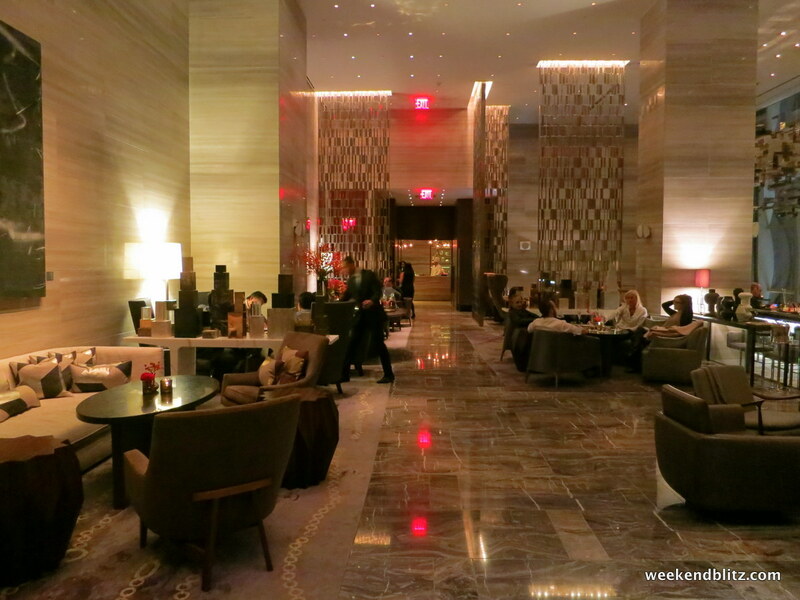 This was fine with as the downstairs lobby was rather informal and to be rushed into checking in at a property like the Park Hyatt New York would have been questionable to me. 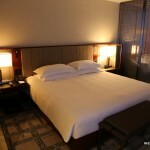 I picture the business traveler or leisure traveling spending $6,000+ over a five-night stay in the city and being rushed through a check-in and given a key as quickly as possible– I don’t care who you are and whether you’re spending personal money, OPM (other people’s money) or using your Hyatt points, if the property fetches in the $900+/night range, you’re at least implicitly asking for some personal treatment, and that entails a proper, formal check-in upstairs. 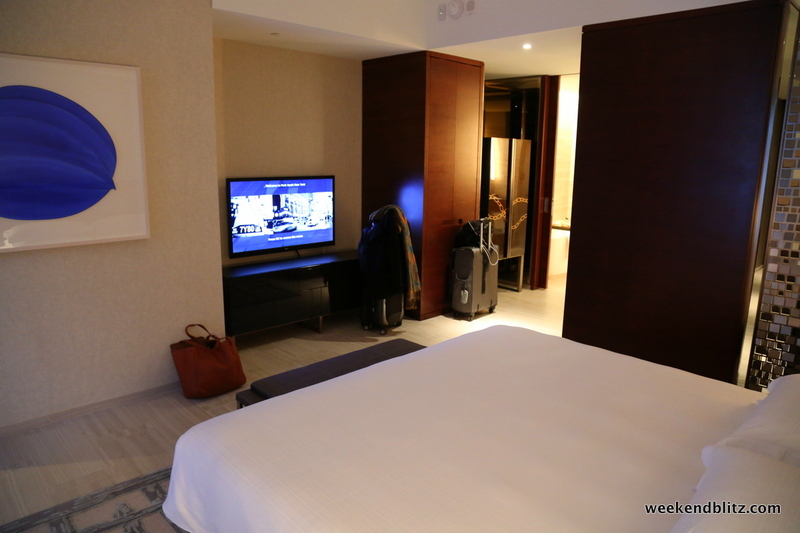 Once upstairs, we were given the check-in spiel and told that we’d been upgraded from the base room to a Park Studio Suite — I’ll take it! 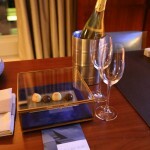 We were offered the option of a 4pm checkout and graciously accepted as we had a late flight out. 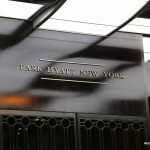 As a Hyatt Gold Passport Diamond member, we were told that we had a $60 per person voucher on our account for breakfast each day. 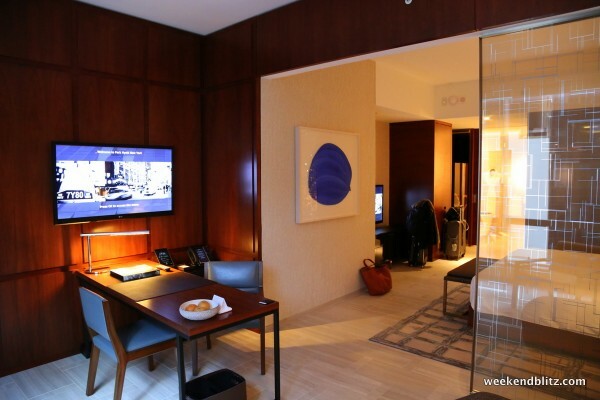 They said this could be taken in the main restaurant, the bar area or by using room service/in-room dining. 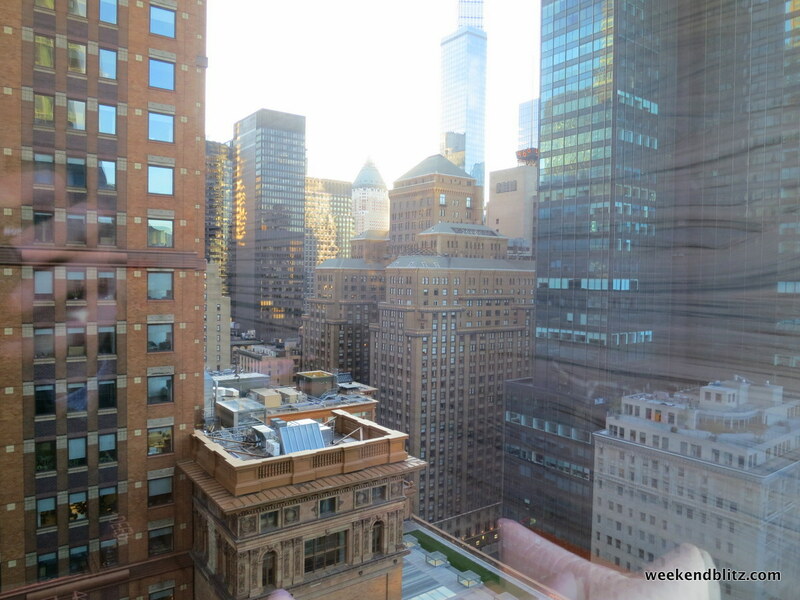 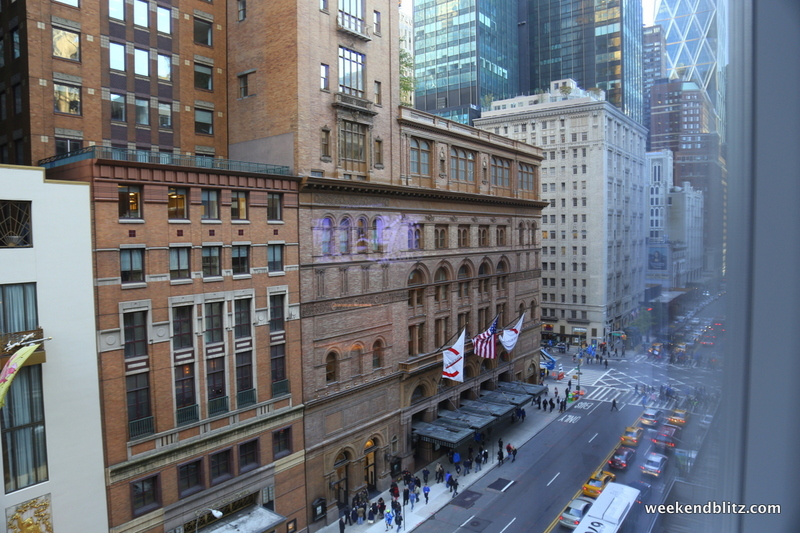 The receptionist escorted us up to our 9th floor suite, number 907, which overlooked 57th Street with views of Carnegie Hall and views as far down as 6th Avenue. 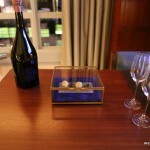 She explained the many great amenities of the room and also mentioned that we could have up to 2 items pressed as part of their complimentary service. 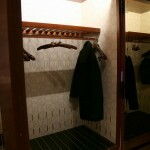 The room begins with a hallway with a huge trunk at the end. 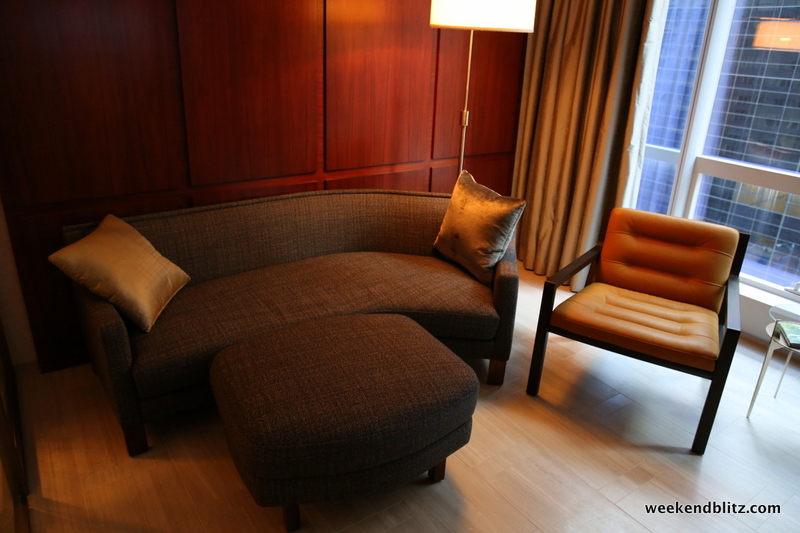 Once at the end of the hallway, a turn leads you to the bathroom on the right and the bedroom then sitting area on the left. 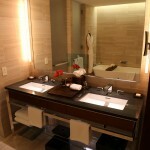 All of the room was very high tech and highly automated. 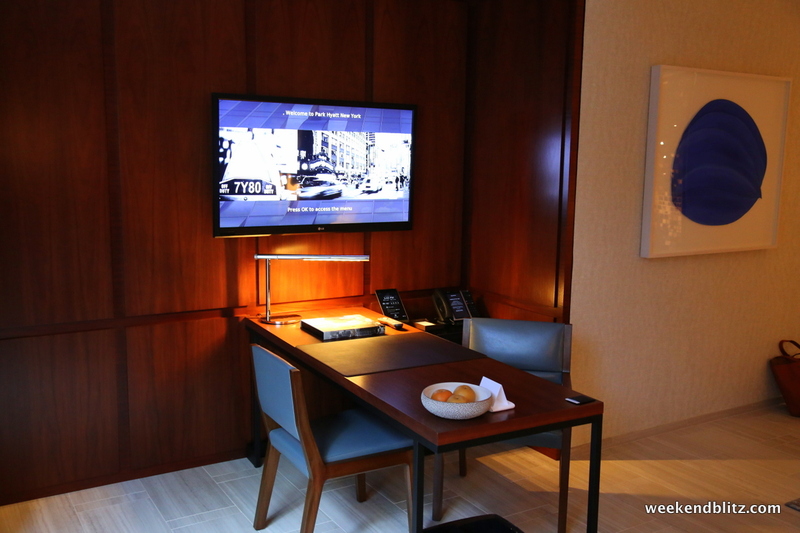 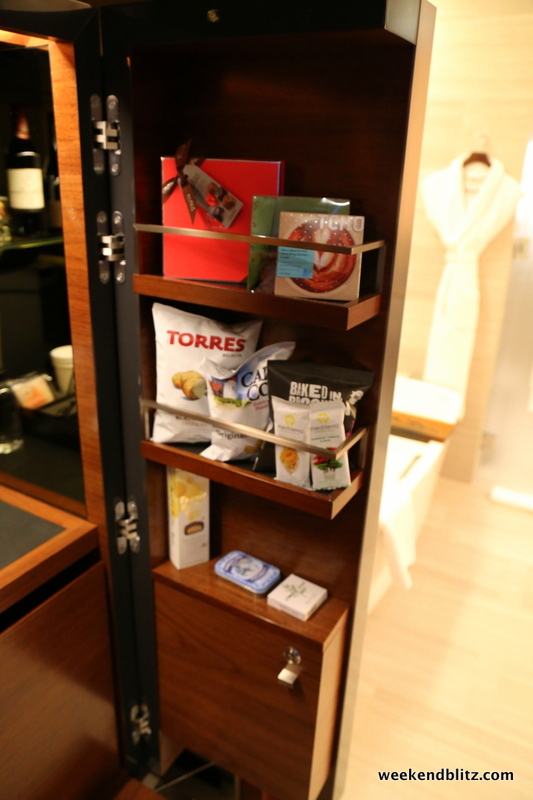 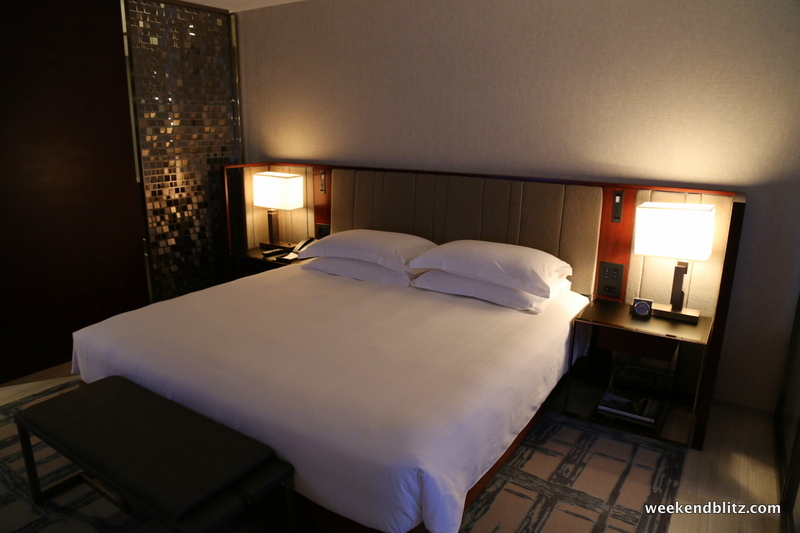 An iPad Mini was available in the room which housed information about the hotel and also allowed for room service ordering. 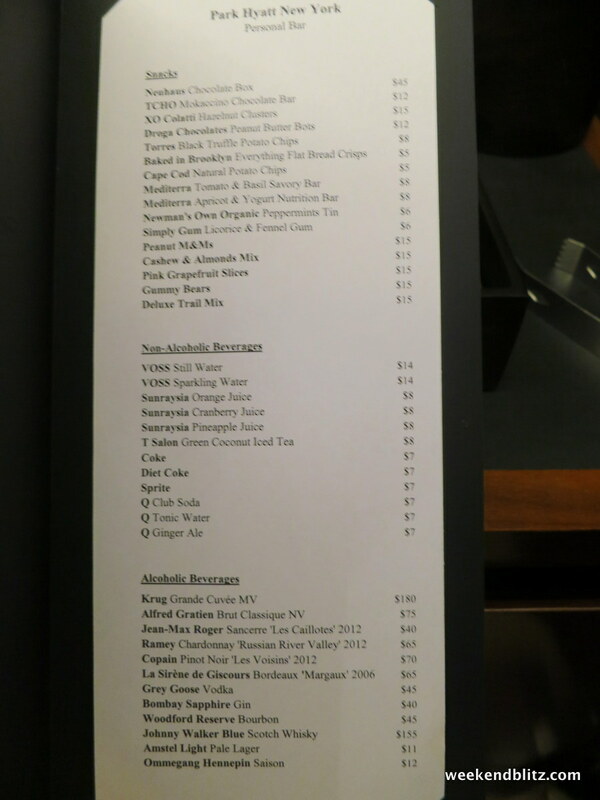 I used the app to request a bucket of ice and had a knock at the room in about 5 minutes. 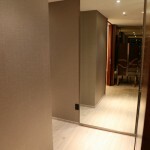 The bathroom is large and roomy with a door separating the toilet and another door to the shower. 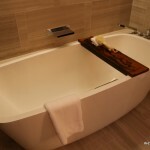 A large bathtub is in the main part of the bathroom next to the sink (with no door separating the tub from the bedroom). 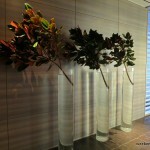 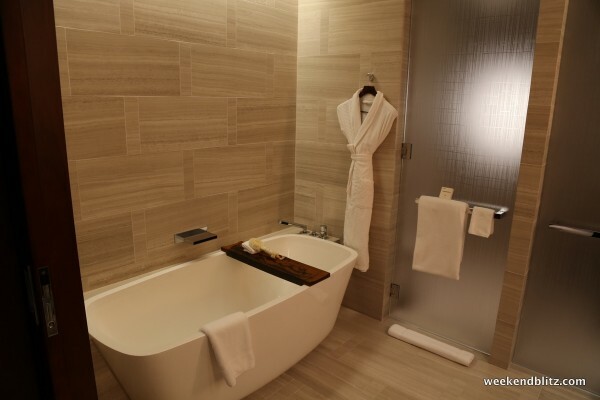 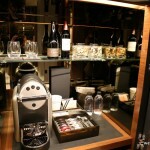 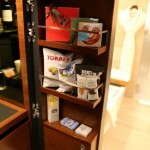 The toiletries all fit the natural theme of the room — very natural, olive oil/aloe vera based products. 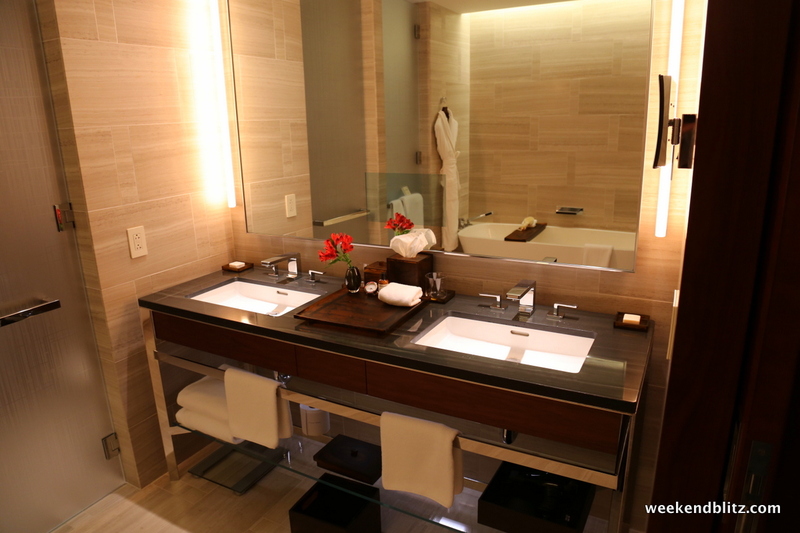 My favorite part of the bathroom is the nightlight– when you wake up in the middle of the night, there’s a small motion sensor that turns on a very faint light, just enough to see but not enough to even begin to wake you up. 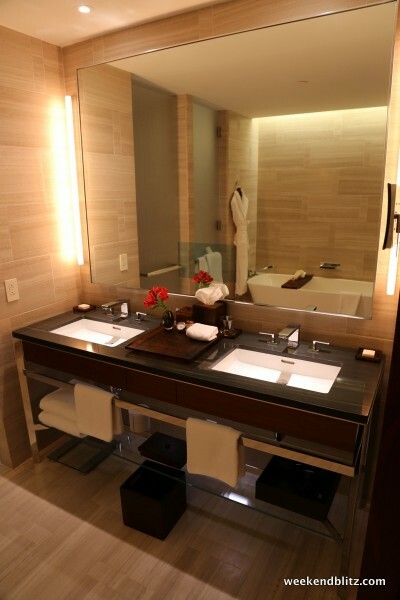 It sounds a little unnecessary, but I can’t count the number of times I’ve stumbled around a completely dark hotel bathroom looking for a light switch. 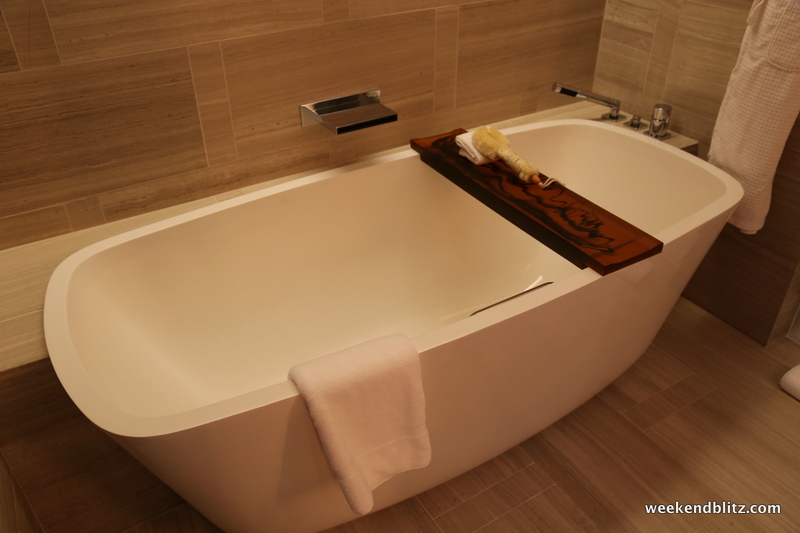 Jeffrey’s favorite part? 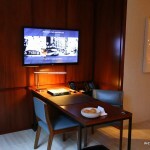 The TV in the mirror. 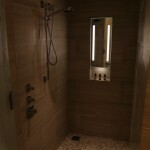 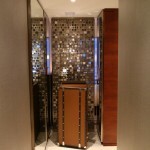 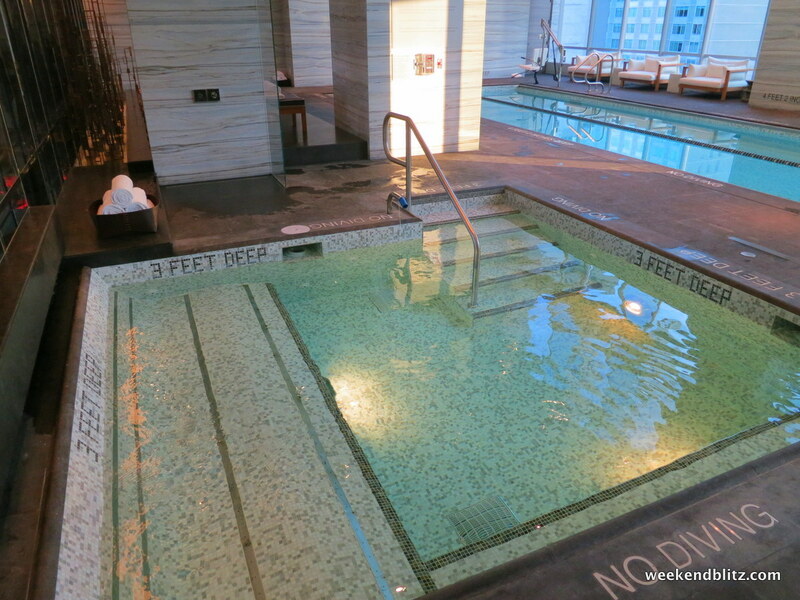 Another cool perk in the Park Hyatt’s bathroom is in the shower. 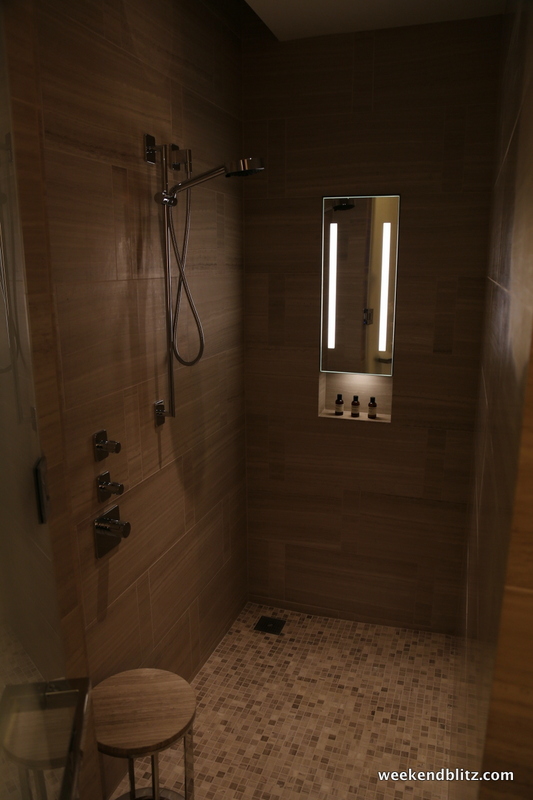 There’s a mirror built into the wall (presumably for shaving your face) and, when the shower is first turned on, it immediately fogs up. 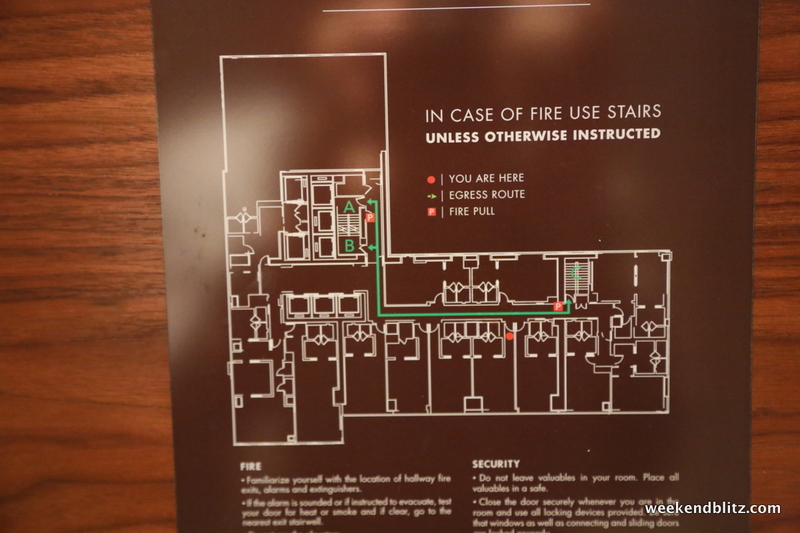 But, soon, the defogger activates and the mirror is defogged… what?! 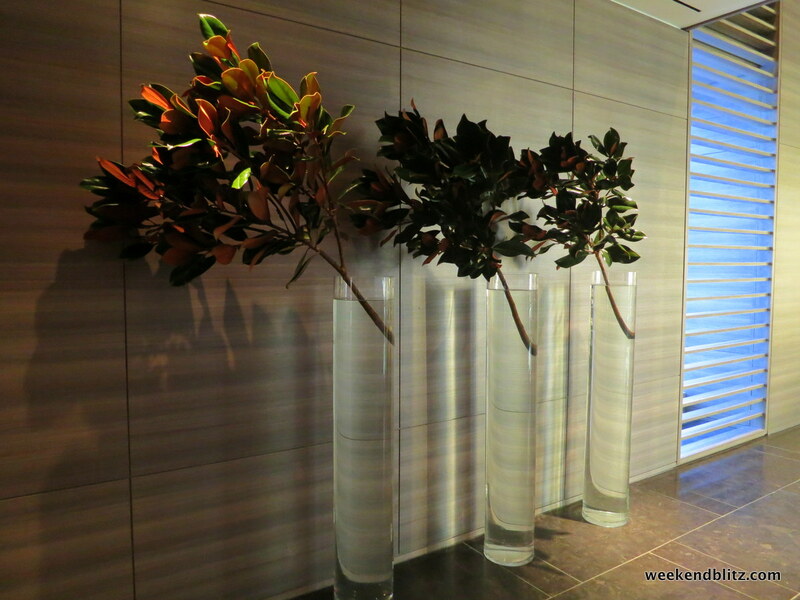 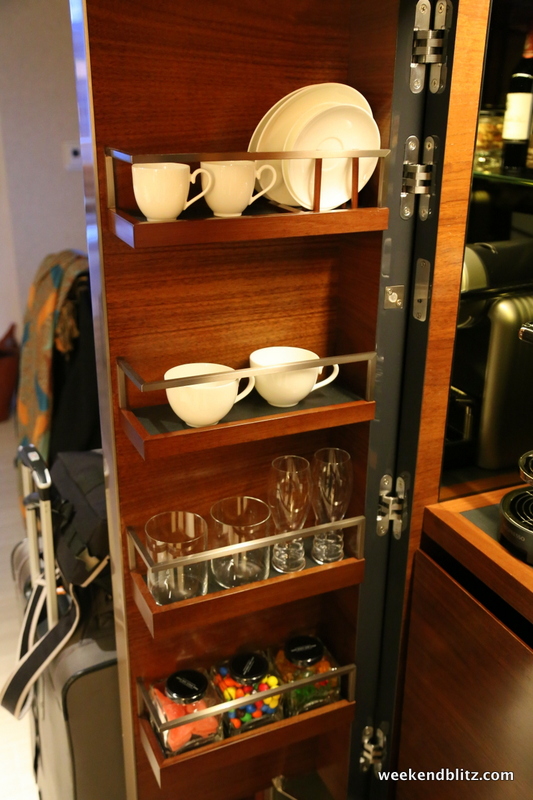 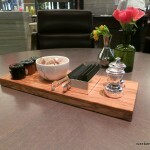 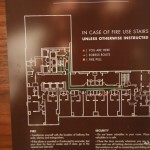 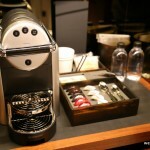 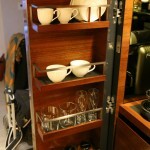 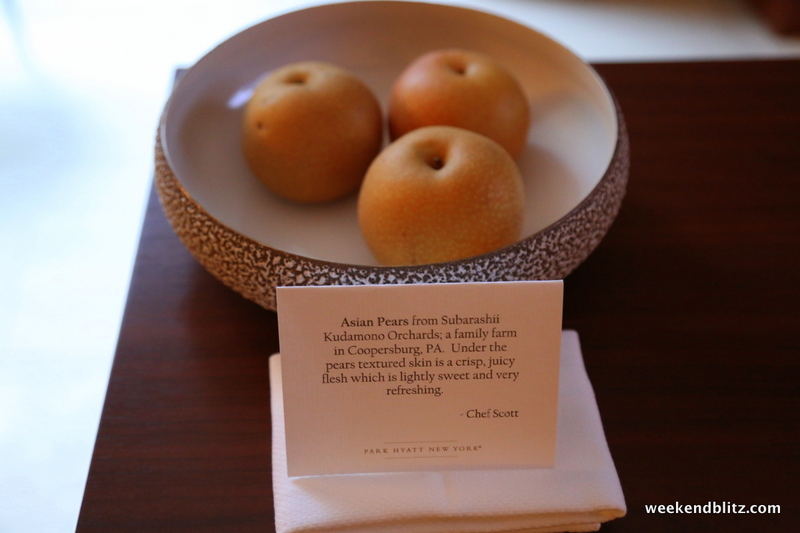 The Park Hyatt is on top of the little details. 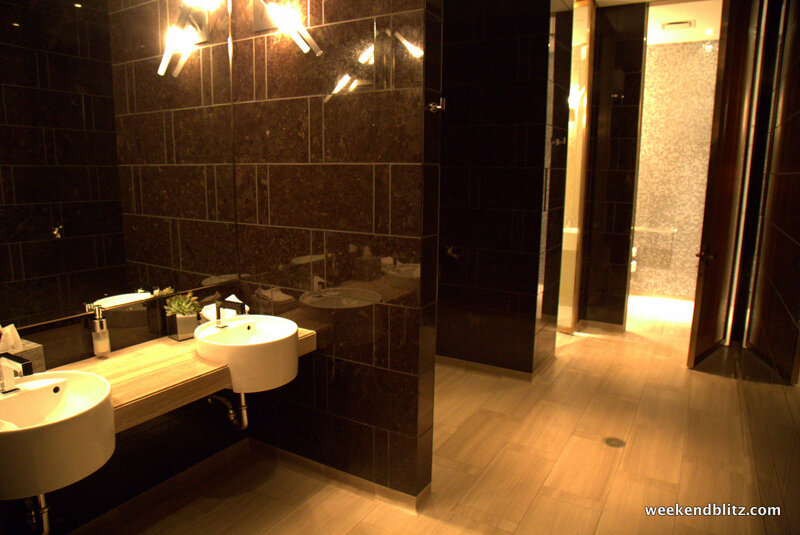 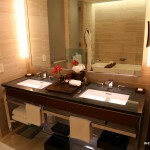 One last note about the bathroom: the white tile and bright lighting made the room feel open and spacious. 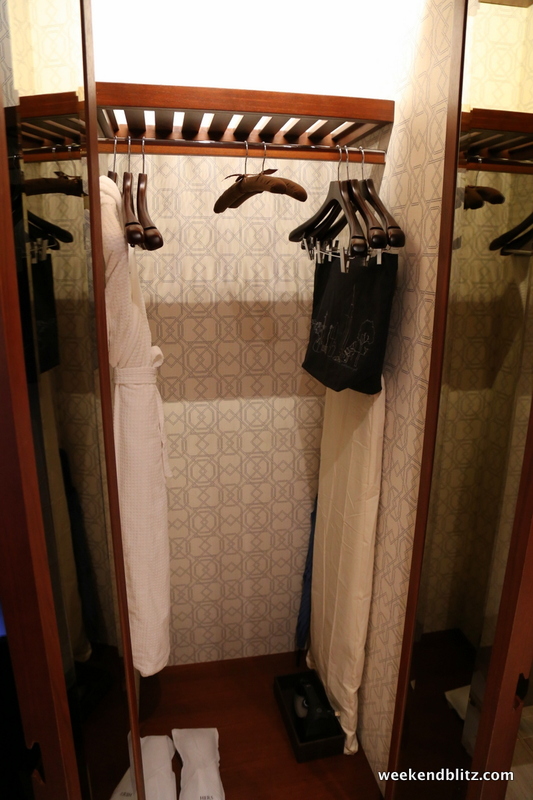 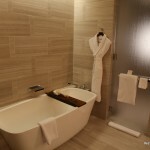 And, unlike other hotel’s bathrooms (like the Andaz Wall Street), I wouldn’t have a problem sharing this room with someone other than my husband. The new trend of showers with no doors in a wide open space is fine except if you’re traveling with your kids or friends– or really anyone where a little bit of privacy goes a long way. 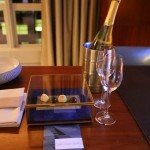 The service at the hotel, unsurprisingly, has been fantastic. 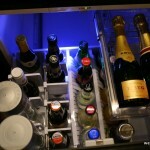 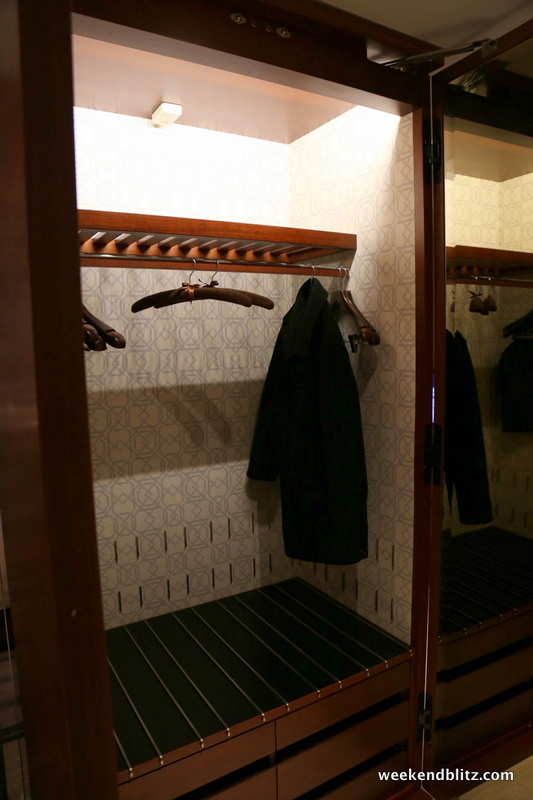 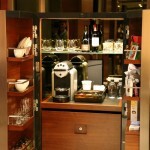 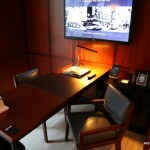 Like all other Park Hyatts, the extra mile goes a long way in impressive guests and making a lasting impression. 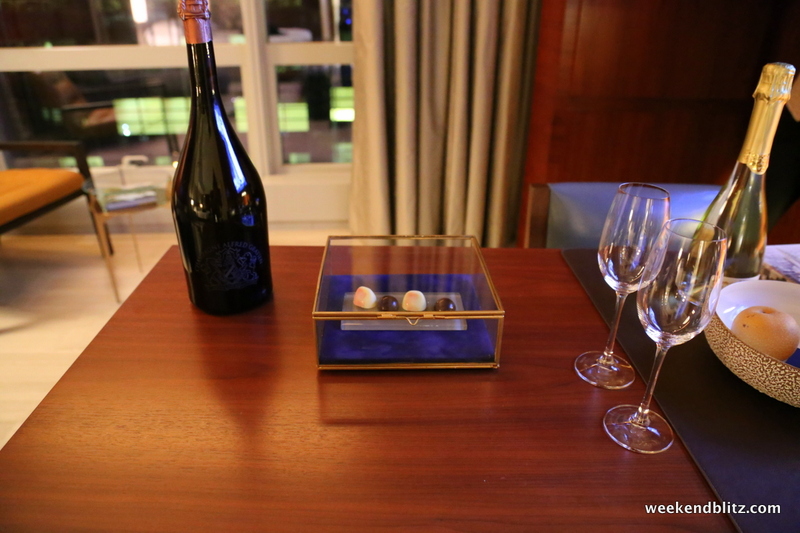 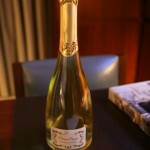 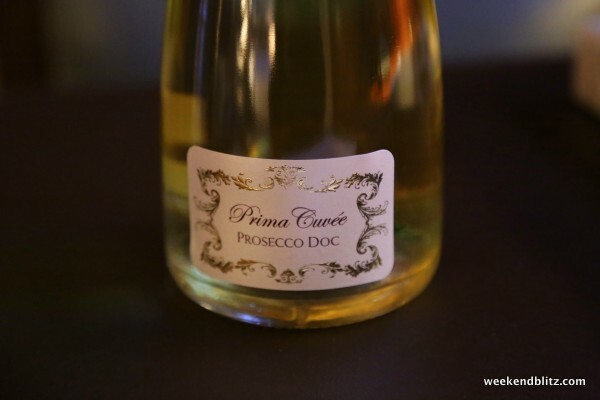 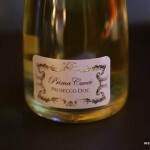 After checking in, we left the hotel for a few hours to explore and returned to a bottle of champagne on ice waiting for us. 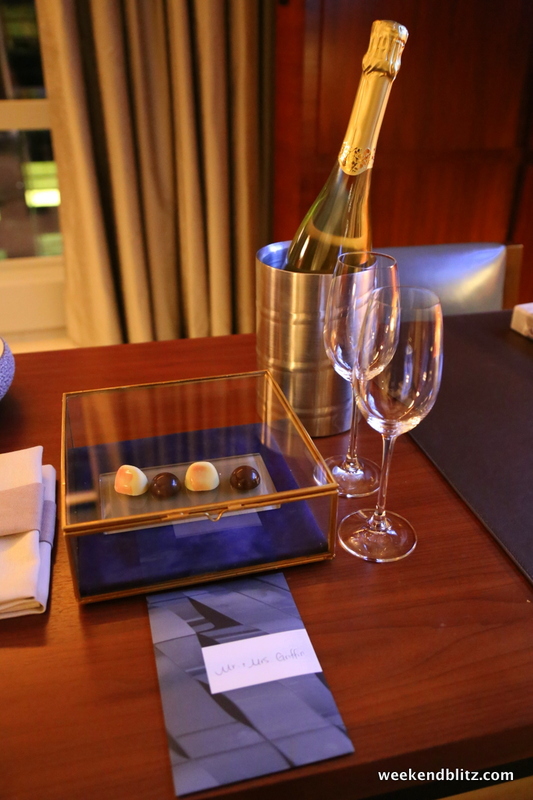 An accompanying note congratulated us on our anniversary and hoped we were having a good time celebrating our special day. 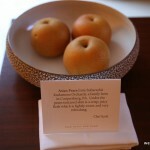 Again, the extra mile was notable and much appreciated. 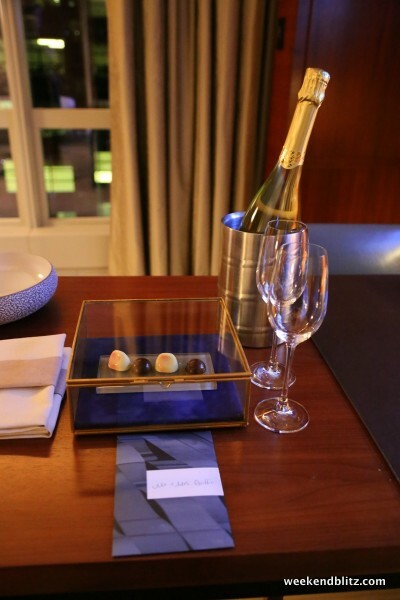 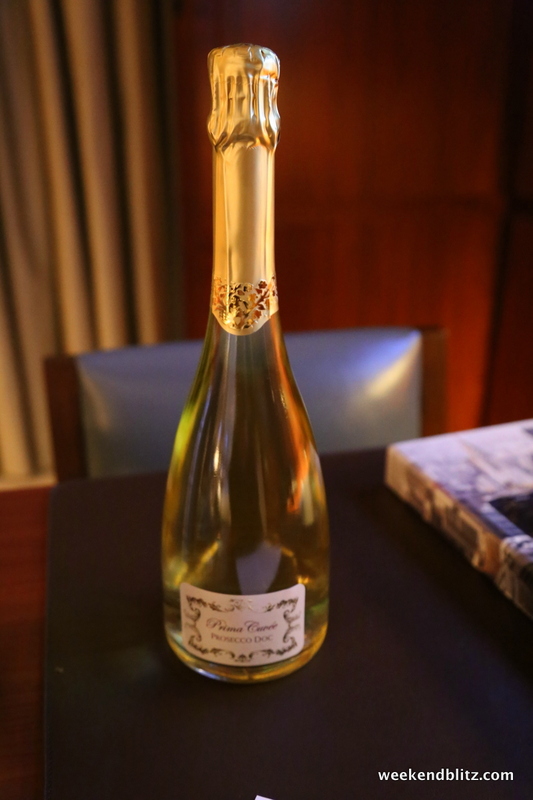 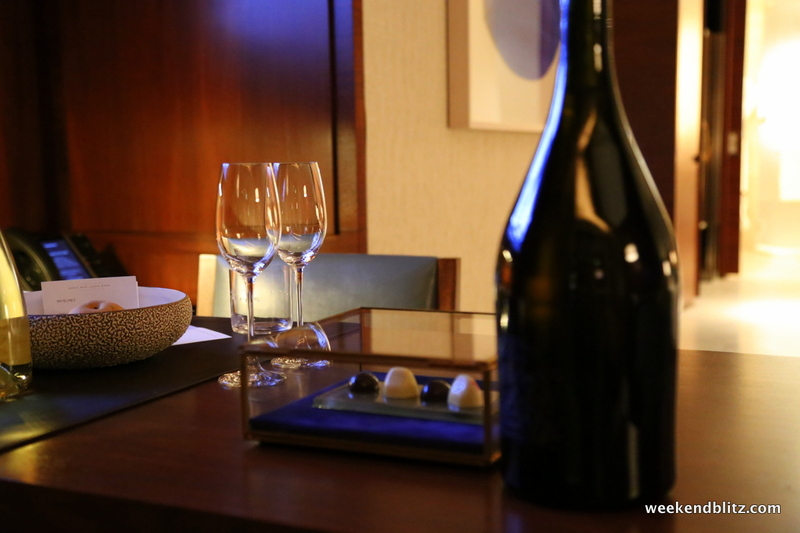 Little touches like this make you remember the Park Hyatt’s extra touch when planning a future celebration. 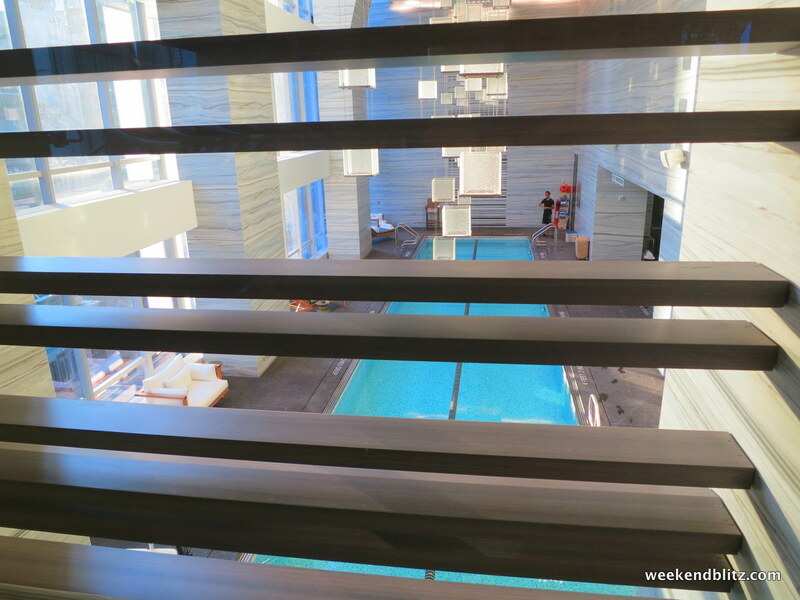 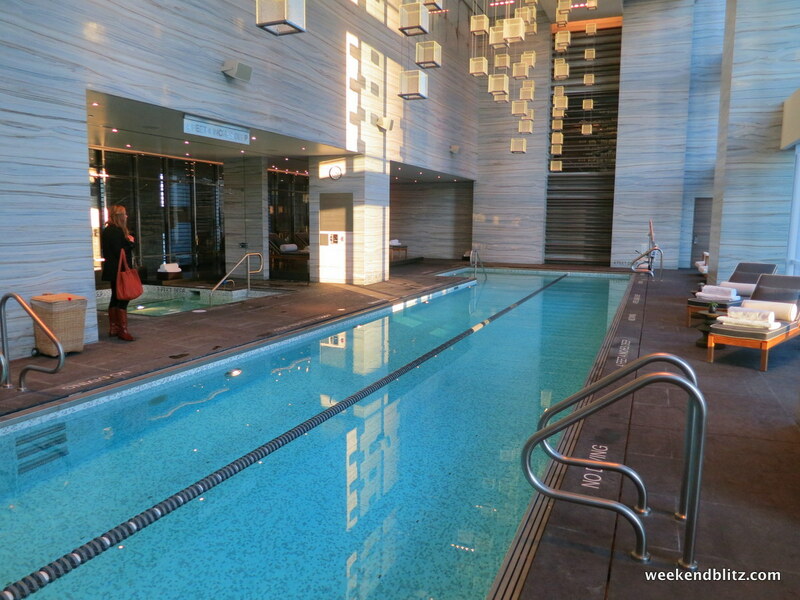 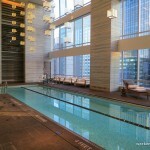 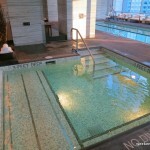 The pool, on the 25th floor, is a whopping 65 feet long, one of the longest pools in Manhattan hotels. 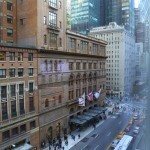 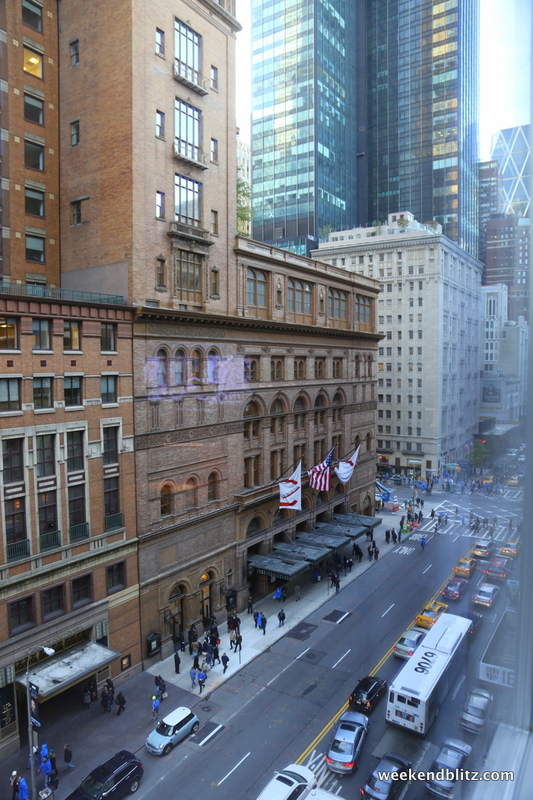 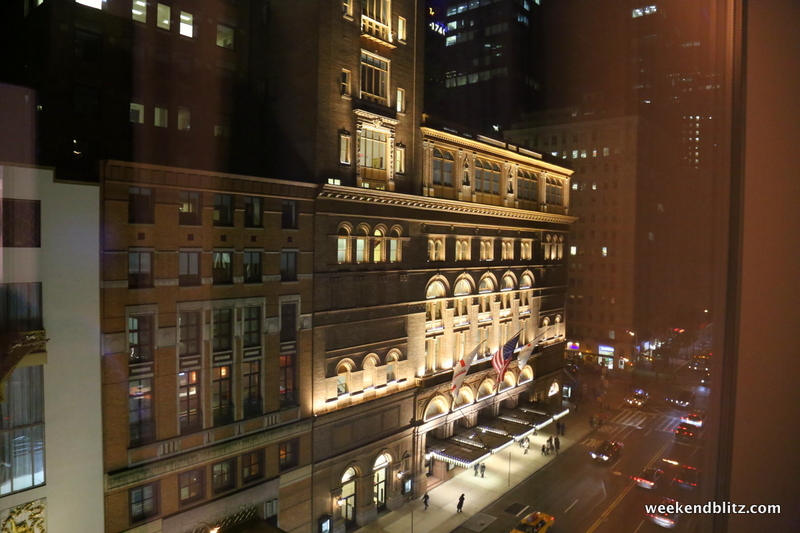 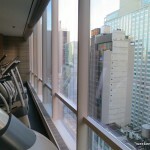 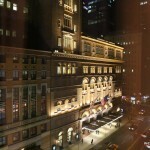 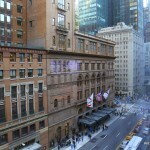 With a wall of windows, the view of Carnegie Hall from the pool is breathtaking. 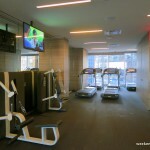 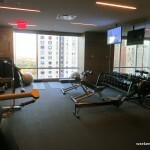 The gym is larger than I expected, with plenty of options. 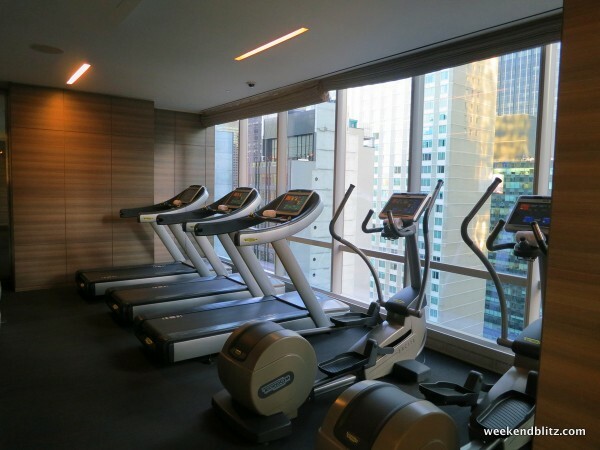 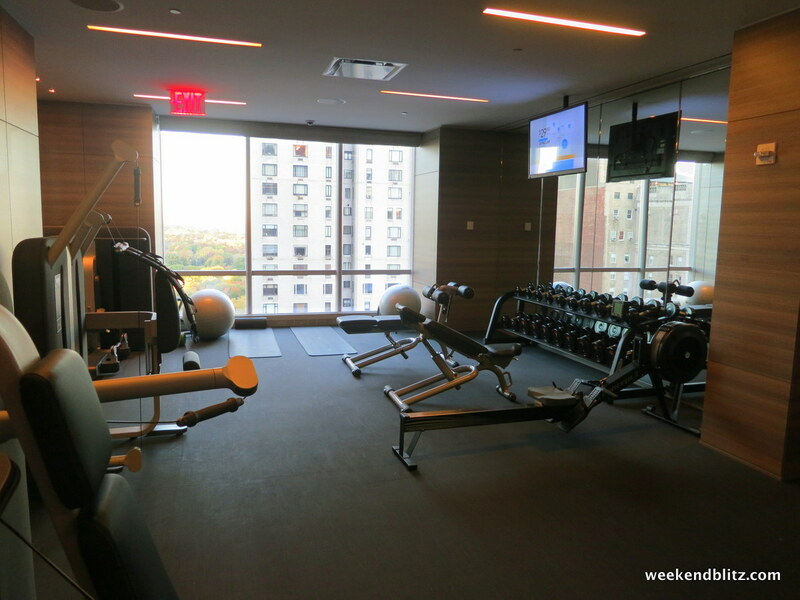 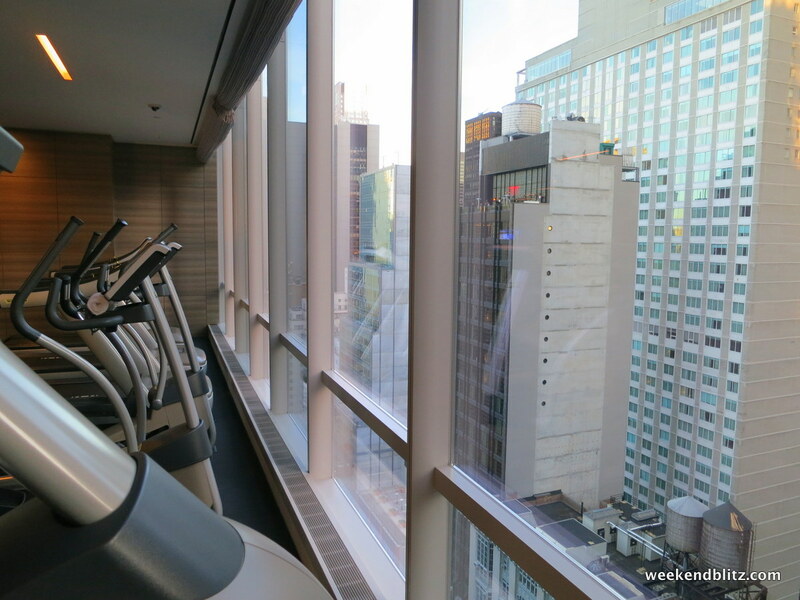 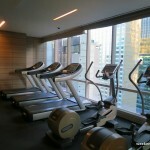 Although my preferred exercise that weekend was walking around to explore, the spacious gym was a dream. 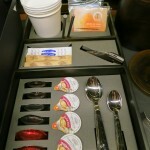 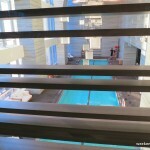 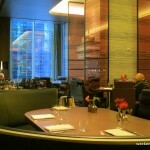 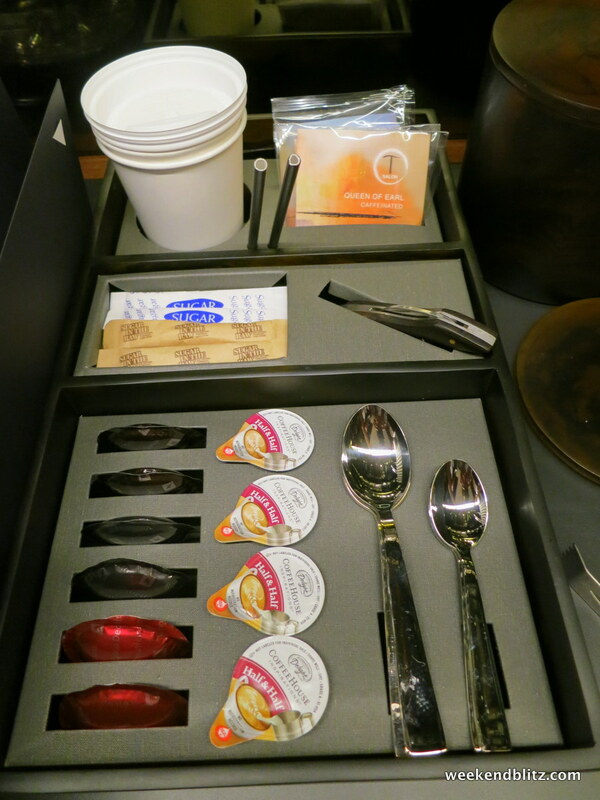 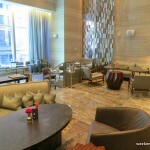 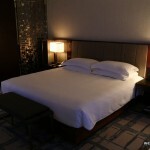 As a Hyatt Diamond member we had breakfast included with the room and could spend up to $60 each. 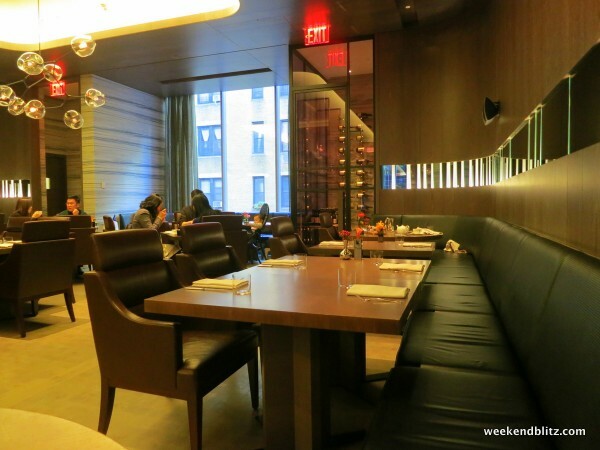 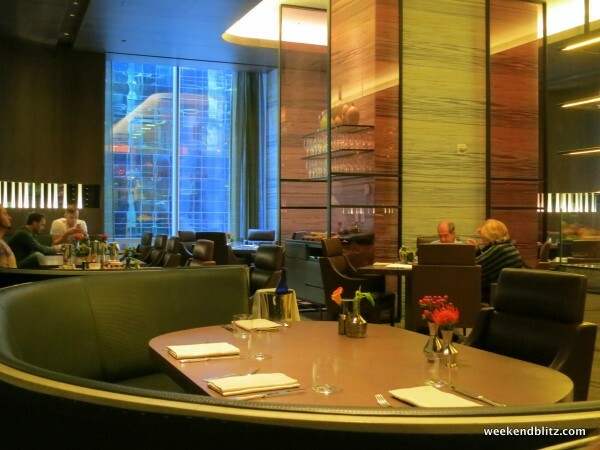 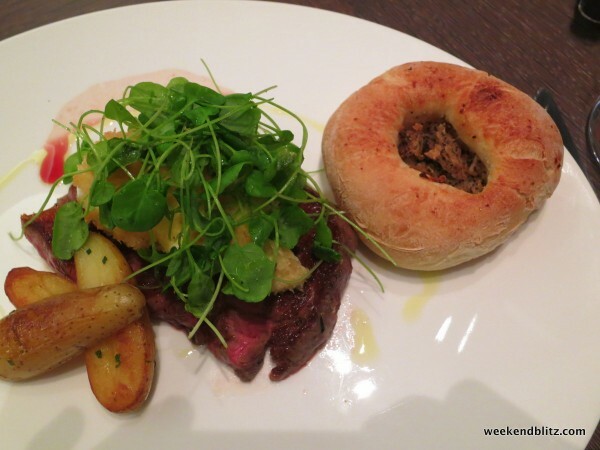 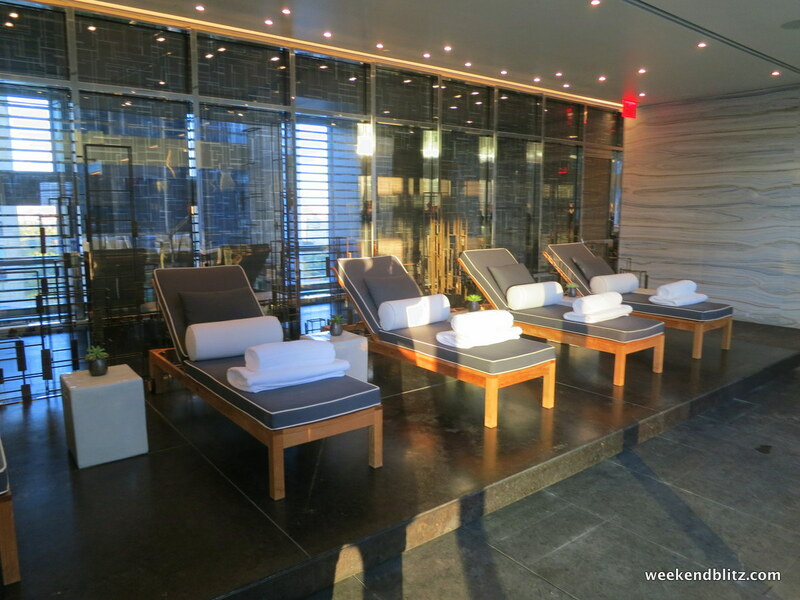 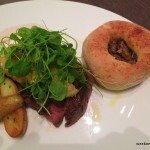 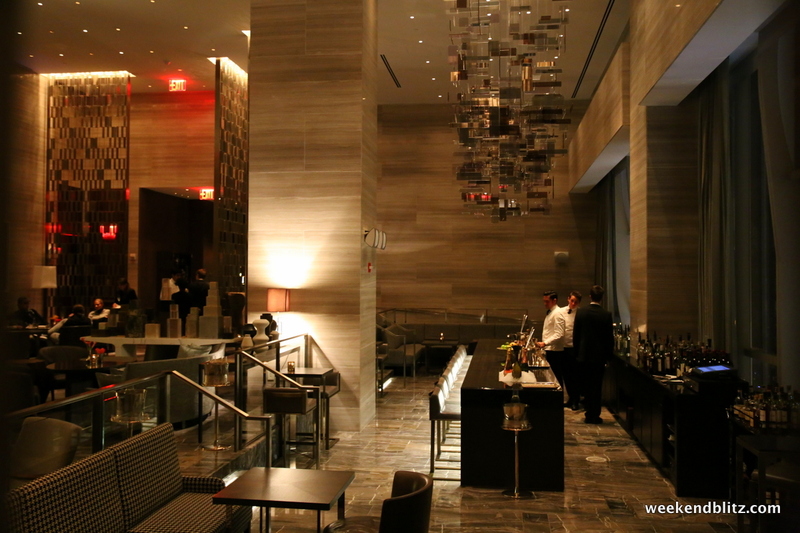 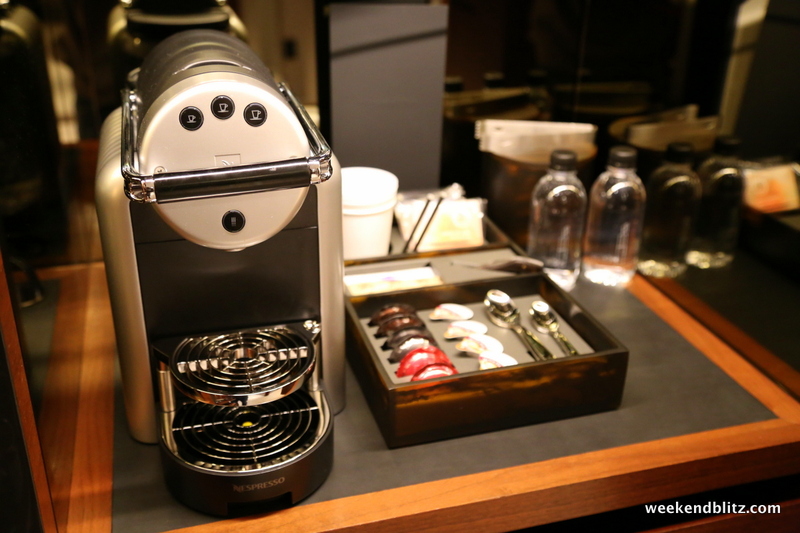 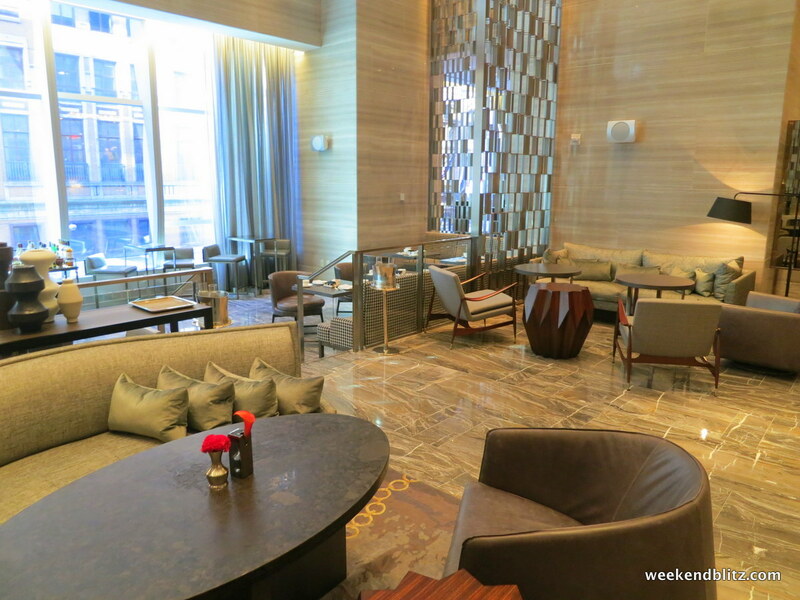 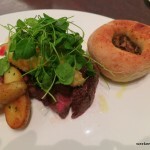 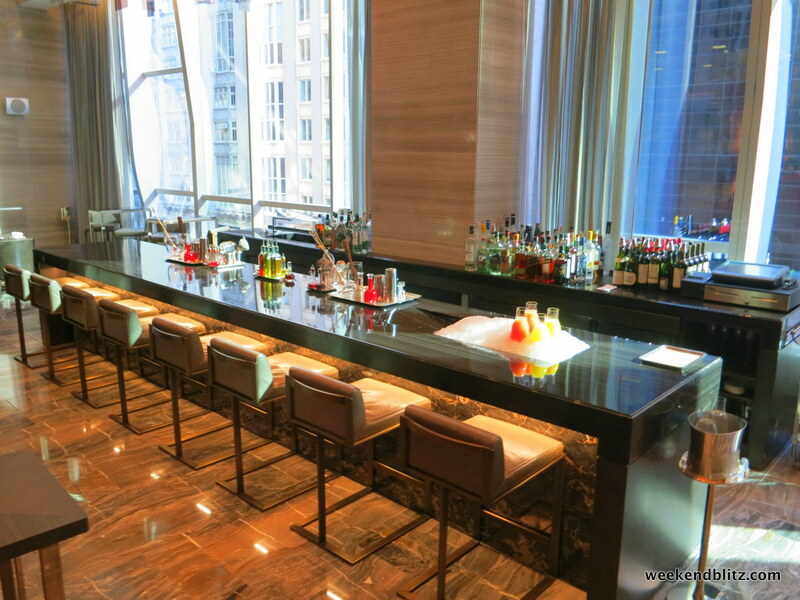 While room service is nice, and available as the Hyatt Diamond breakfast amenity, we didn’t want to miss out on a meal in the main restaurant so we headed down to the Back Room, the Park Hyatt New York’s in house restaurant. 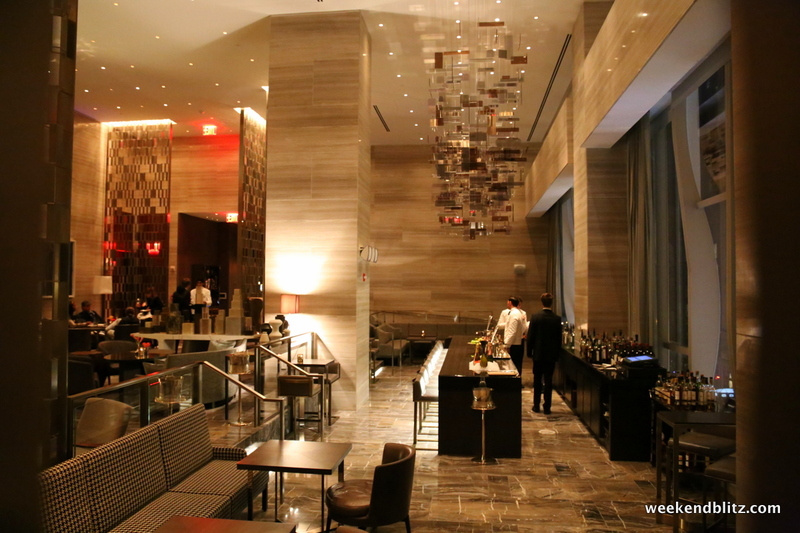 The chef, Sebastien Archambault, hails from the Park Hyatt Washington’s famous Blue Duck Tavern–review attached–(a favorite of President Obama). 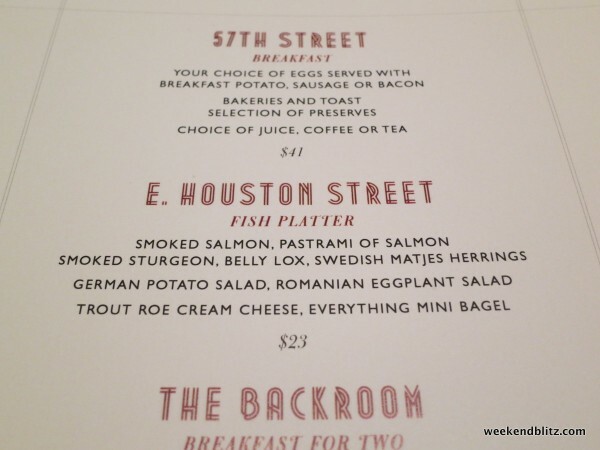 If you think it’s hard to spend $120 for two at a hotel breakfast, think again. 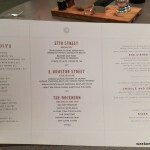 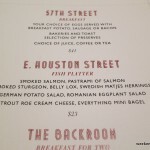 I tried the WAGYU SIRLOIN ($48) with crispy poached egg and onion and Jeffrey tried the 57TH STREET FISH PLATTER ($23), complete with smoked salmon and pickled herring. 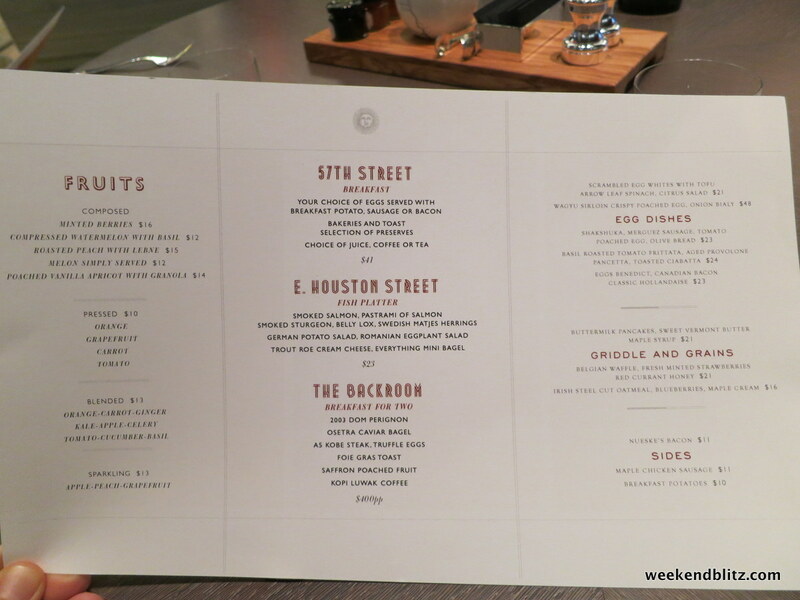 Those entrees paired with a $13 juice each quickly brought us up to our $120 target. 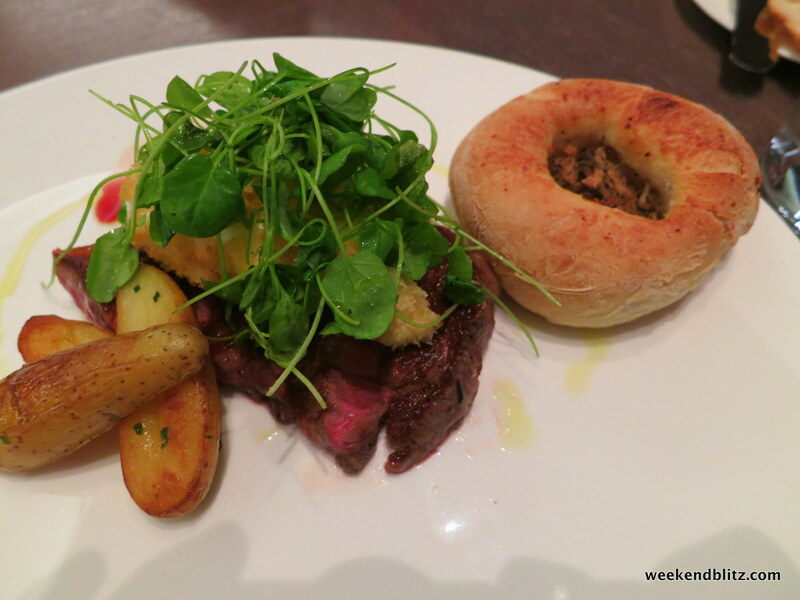 The steak was cooked to a perfect medium and was so delicious that it melted in my mouth. 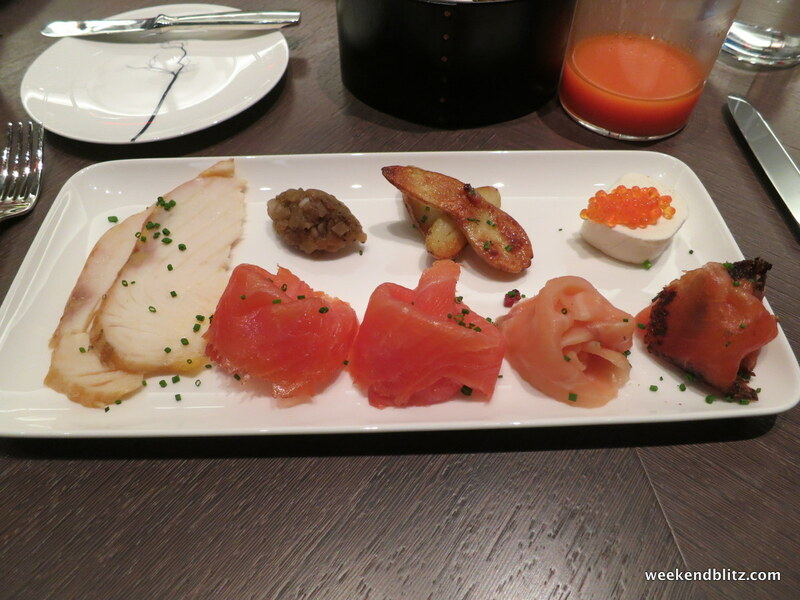 Although it was a nice portion, I had no problem finishing the plate – it was the perfect amount of food. 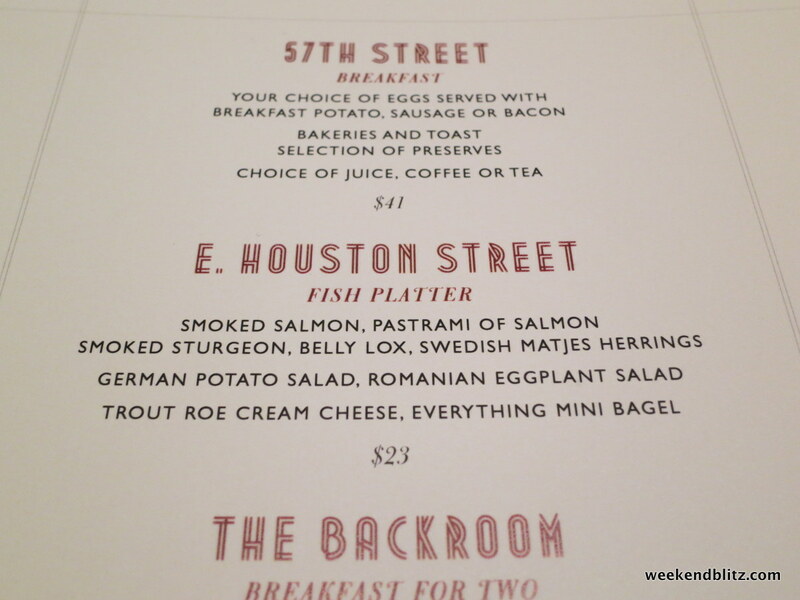 Jeffrey’s fish plate was tasty, too, and a nice substitute for the traditional egg breakfast. 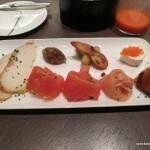 The smoked salmon was full of flavor and paired perfectly with the fish-roe-topped-cream cheese. 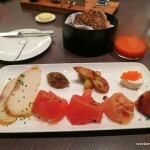 While we were in a slight hurry to get on with our day, our breakfast took about one hour from start to finish. 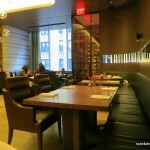 It seemed that most people wanted to sit and enjoy their time in the restaurant rather than rush. 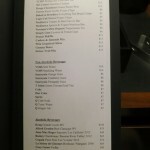 Even after we were finished, the waiter mentioned something about relaxing and Jeffrey just asked for the check instead. 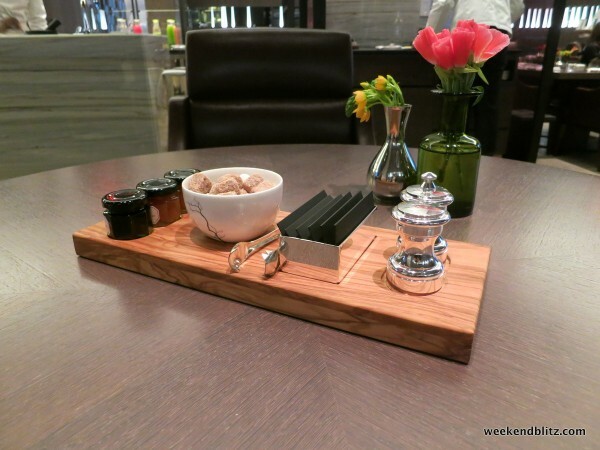 The extra time wasn’t annoying — rather, we appreciated the unhurried attittude of the waitstaff and would much prefer a slightly longer breakfast than a rushed one. 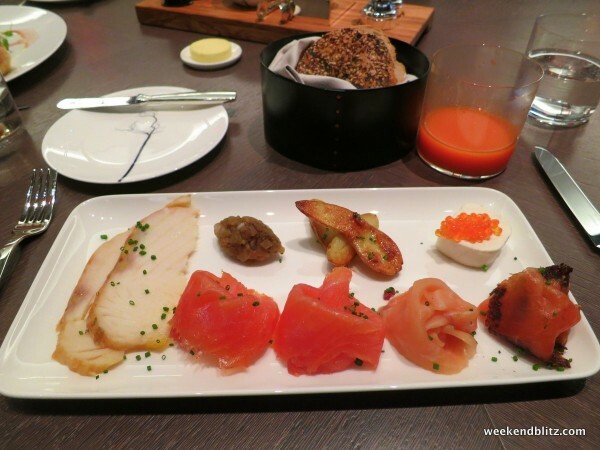 This unhurried breakfast was an interesting carry-through on the belief that Park Hyatt is a destination in and of itself, so no need to hurry out the door for bigger and better experiences. 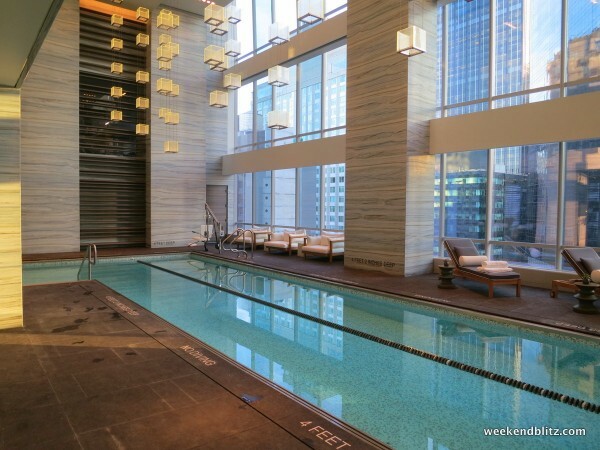 BOTTOM LINE: The Park Hyatt’s luxury, prominent location and cozy suites made our celebratory weekend a trip to remember. 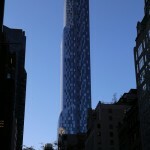 I liked our stay so much that I’m trying my best to talk Jeffrey into buying one of the condos in the One57 tower above the Park Hyatt. 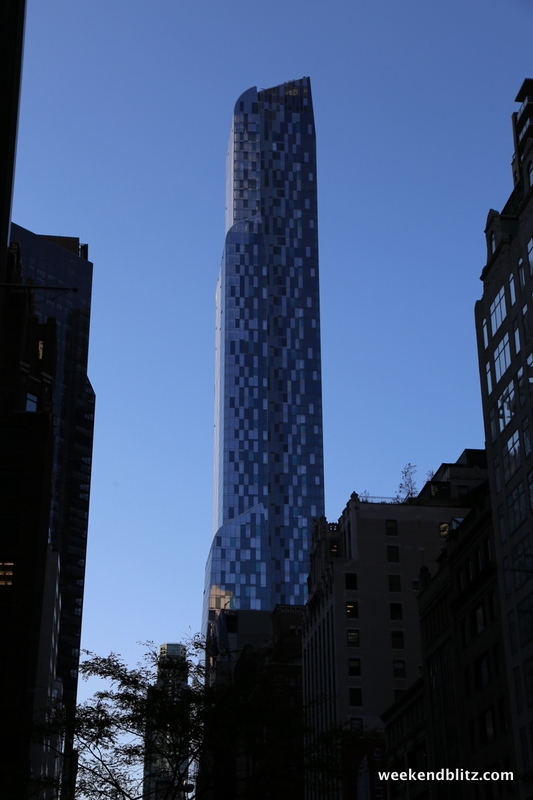 The only problem so far is the $90 million price tag. 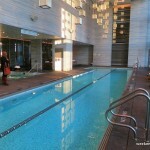 This brand new building houses the Park Hyatt in the first 25 floors.